Life as I see it…. Haven’t been blogging much of late. You might have noticed. Due to major engineering works on my train line into London during the whole of my long summer holiday, I was effectively grounded. They may well have been improving the platform lengths at Waterloo but this caused my cultural growth to be temporarily truncated. 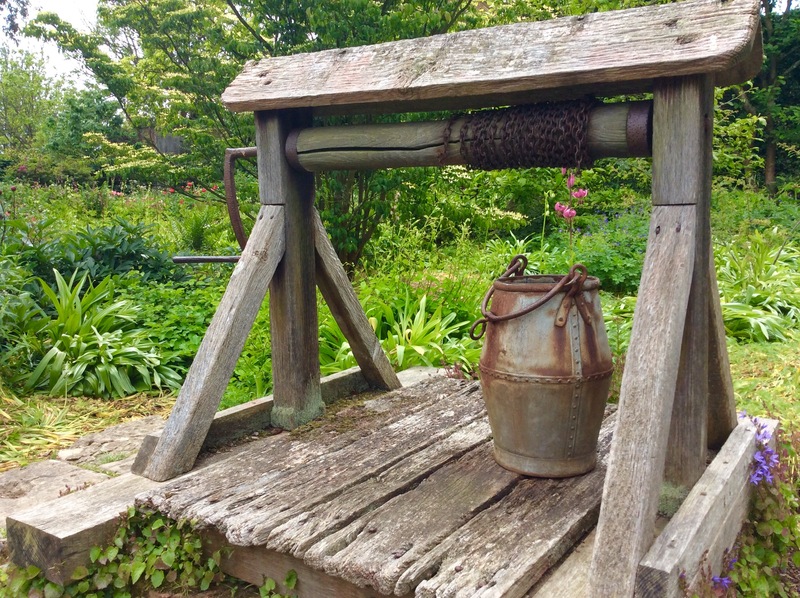 I wanted a break and I didn’t particularly want to write so I turned my focus homeward and spent my entire summer decorating, gardening and up-cycling old furniture. I had a thoroughly enjoyable five weeks, rolling out of bed straight into painting clothes, hair unbrushed and just getting on with it. More about that another time – I really must get back to some writing now the darker evenings are drawing closer – but for now, here’s a post I found yesterday, semi-forgotten and half written in my WordPress draft box. 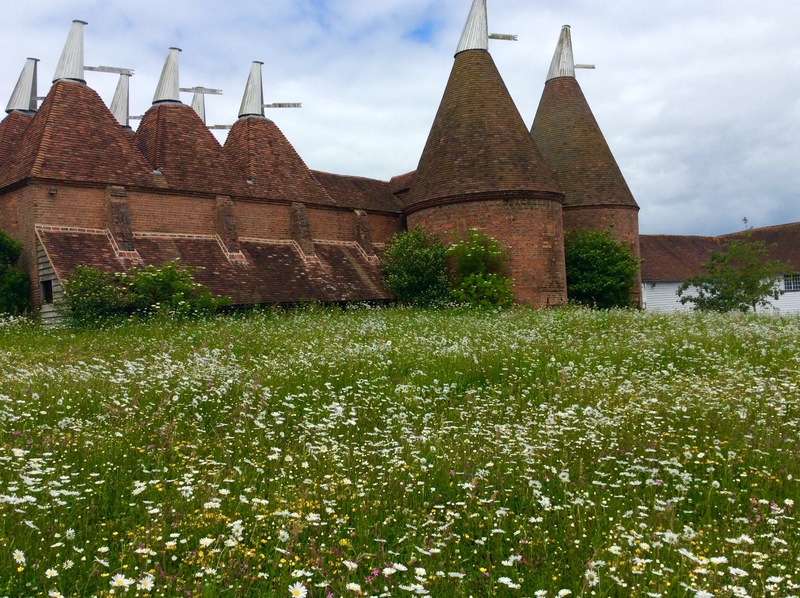 And so it came to pass that, with temporary membership in hand, I left Sissinghurst (see previous post) and wended southwards to Lewes. 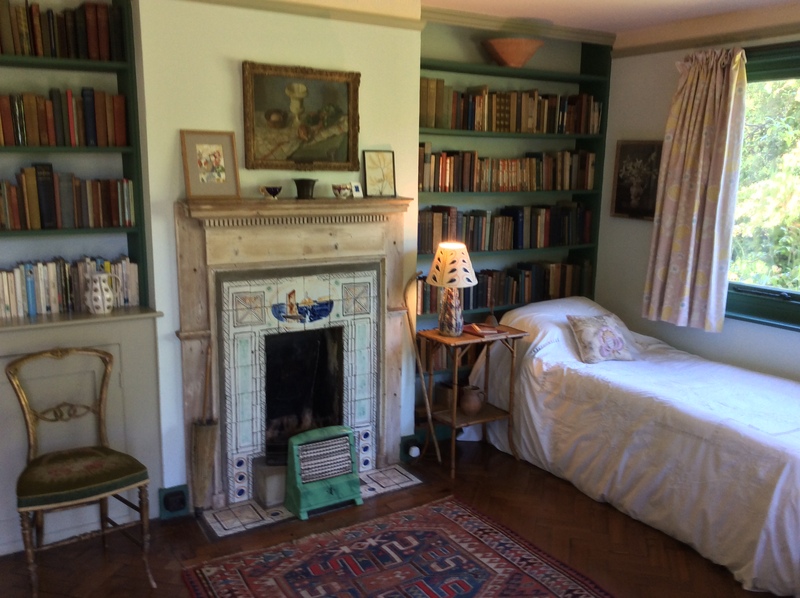 Now Nationally trussed and fully paid up with guide book in glove compartment, I decided to check out Virginia Woolf’s house. 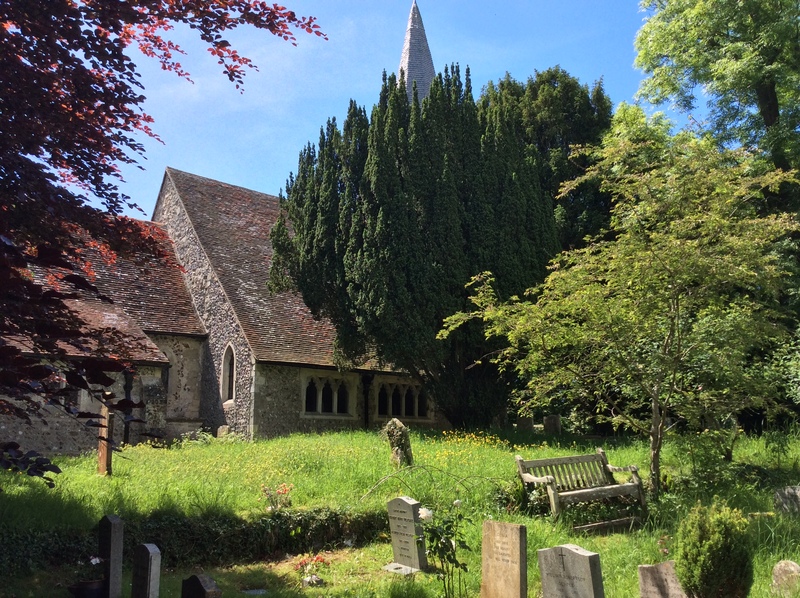 The journey took me through some stunning Sussex countryside and as I bowled happily along the A27, listening to my Rolling Stones compilation with my intended destination only a few miles away, I remembered somewhere else I needed to see first. 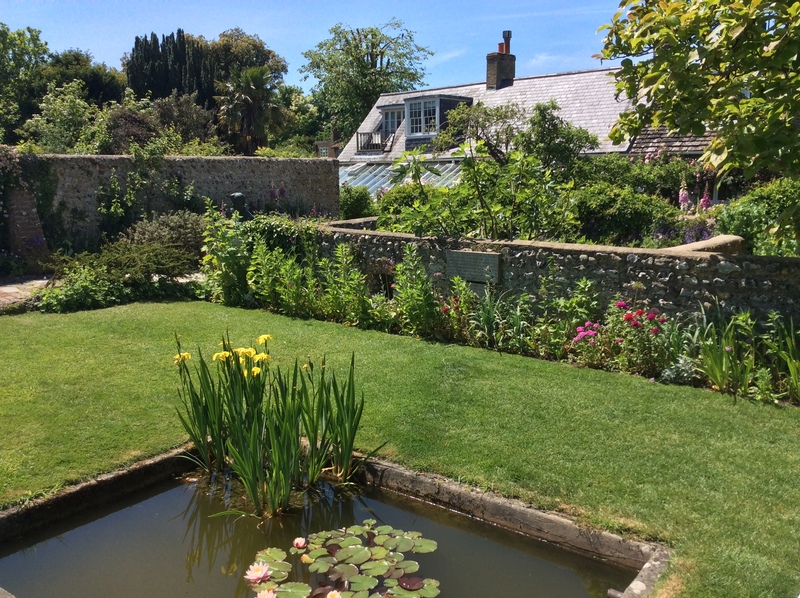 A couple of years ago I visited Charleston – the beautiful home of Bloomsbury Group artist Vanessa Bell and, not so coincidentally, the sister of Virginia Woolf. 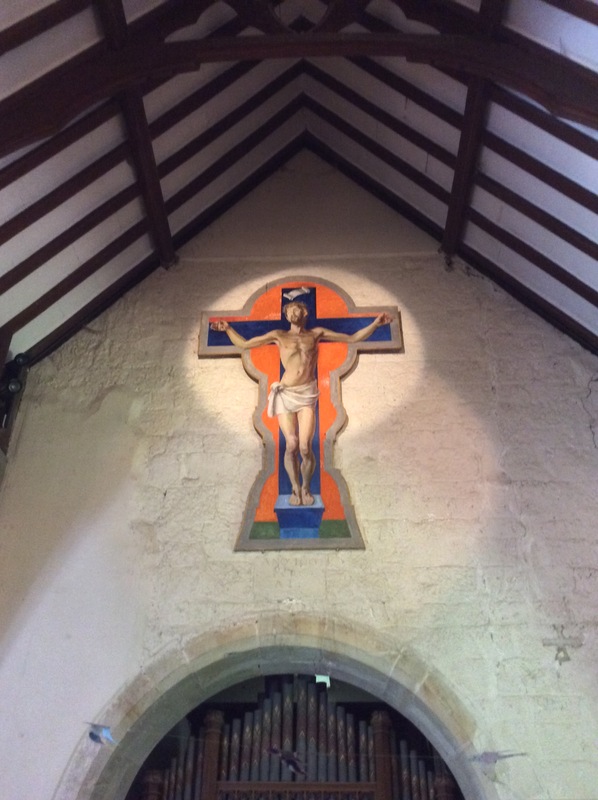 The place was so enchanting that I ran out of time to see nearby Bewick church, the interior of which was decorated by Vanessa, her son Quentin Bell and her lover, Duncan Grant. I turned off the main road down a very narrow country lane and found the tiny church behind an old stone wall. There was no one about; I had the place to myself. From the outside, the building looks pretty much like any other small rural country church, but inside is a wonder to behold. 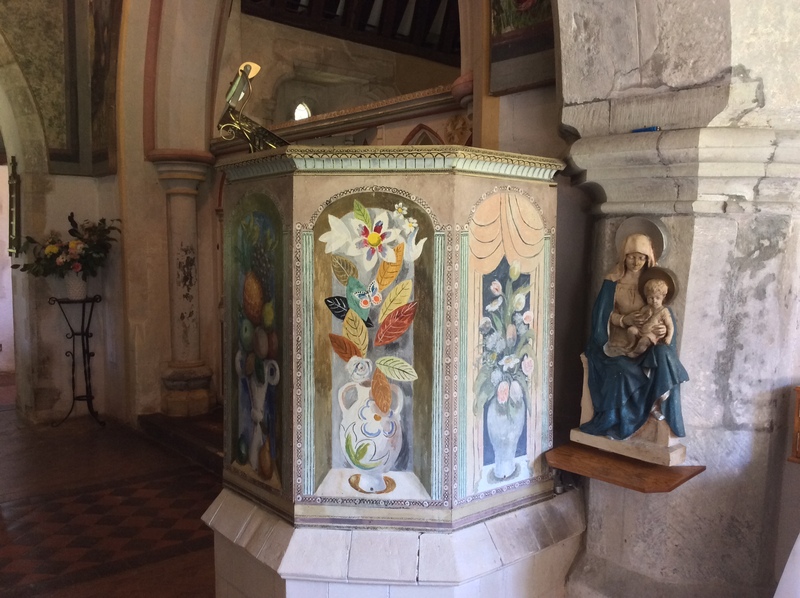 Not only are the walls adorned with these fantastic murals, the pulpit also retains its original Bloomsbury design. Pleased I’d made the minor detour, I sallied forth (I’ve always wanted to say that: it seems to fit in here) to the tiny village of Rodmell, just south of Lewes in East Sussex. It was devilishly difficult to find. Usually there are plenty of brown signs indicating a tourist attraction but there were none. I’d consulted the map before I’d set off. When I say map, I mean a paper one. I don’t have or want a Sat Nav although I do use Google Maps to help plan a journey beforehand but on the road I stick to my trusted old, much thumbed, AA version that is unravelling from its spring binder. The old-fashioned way worked a treat. 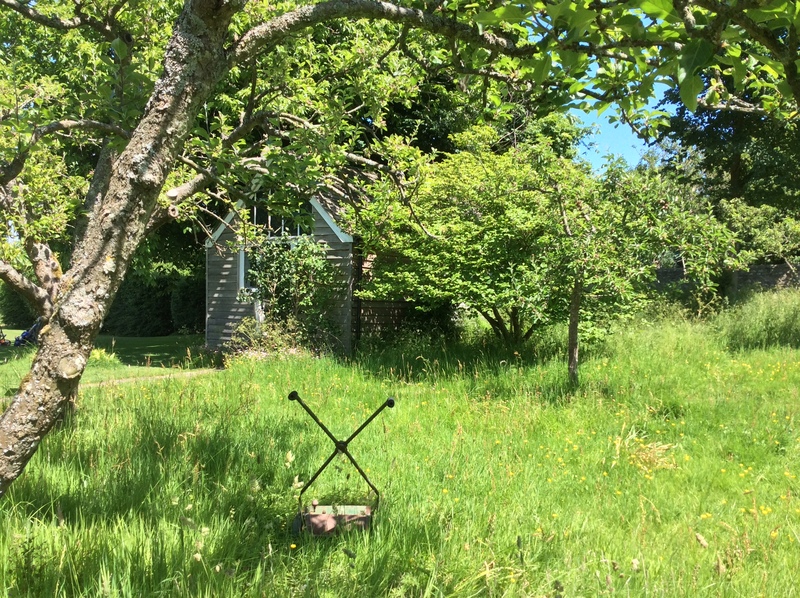 At the end of a narrow village lane, encrusted with soil deposited by recent tractor wheels, I discovered Monks House, the 17th century country retreat of Virginia Woolf and her husband, Leonard. 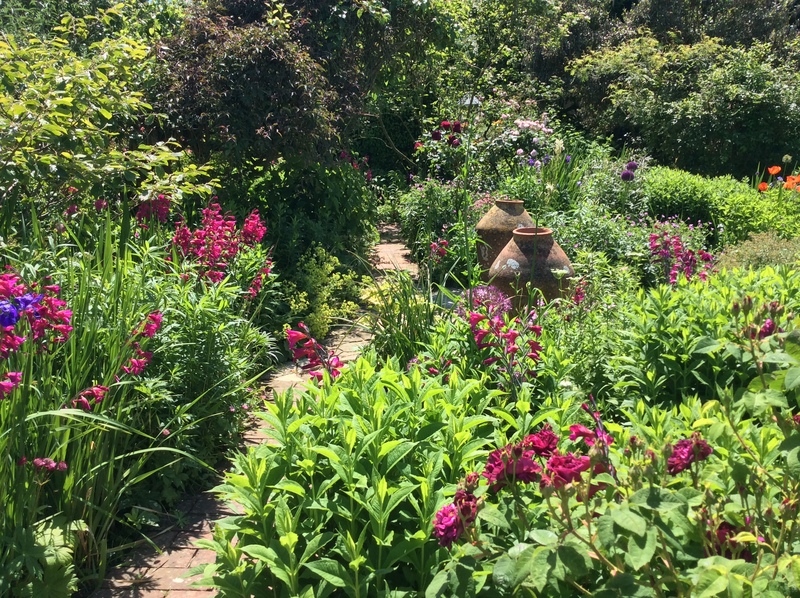 The house is small and unassuming, set in a garden which was a riot of colour when I visited. 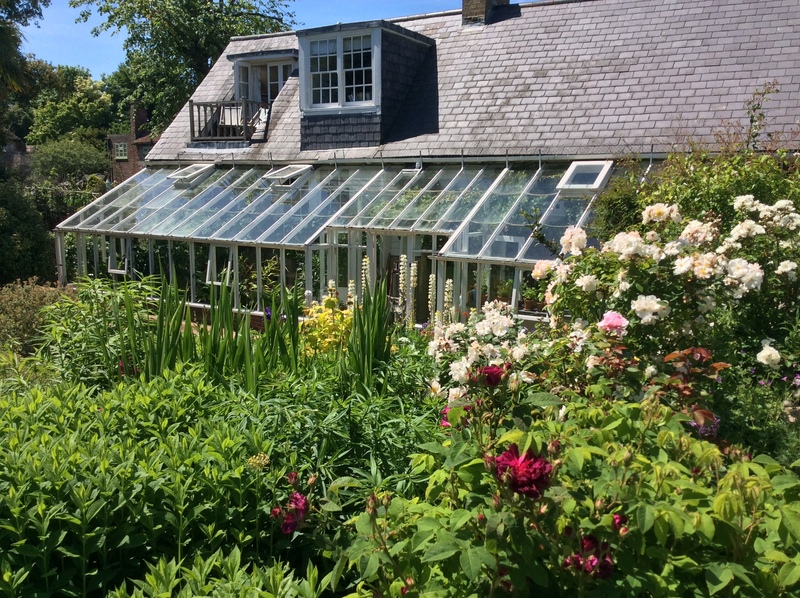 Bought by Virginia and her husband during the 1920’s as a bolthole from their increasingly busy London life, the couple added to and improved the house over the years until in 1940, they began living there full time after their London apartment was damaged during wartime bombing. The living room is a mismatch of colour, pattern and styles…but it works. 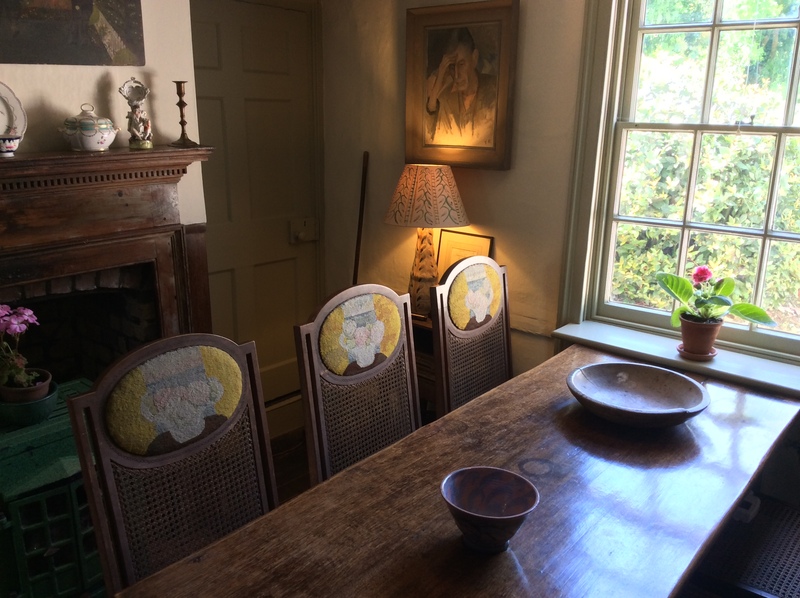 The delicate painting on the backs of these dining chairs is the work of Virginia’s sister, Vanessa Bell. 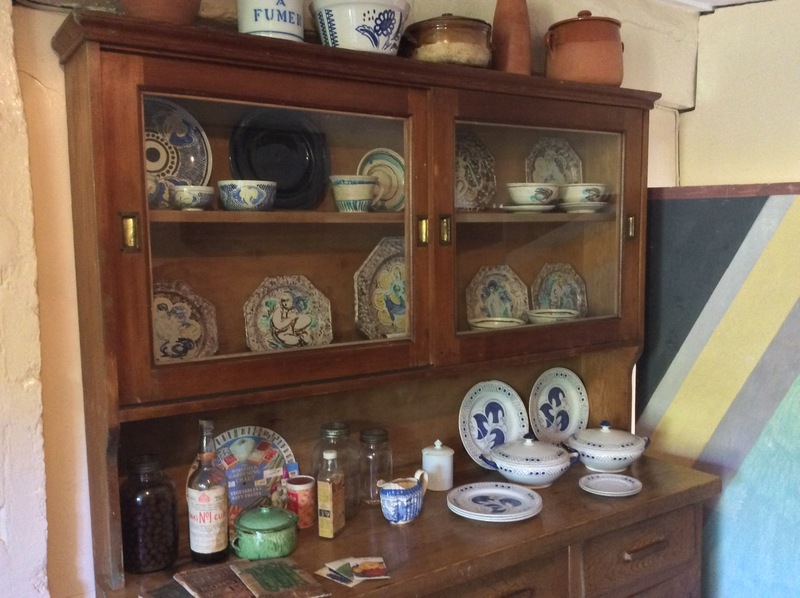 And I can’t resist a jumble of plates and miscellanea on an old dresser. Virginia’s bedroom is approached by its own door from the outside – an extension to the original building. One immediately gets the sense of her own private domain. It is a shame that none of the books filling the shelves actually belonged to Virginia – especially as the volunteer guide cheerily informed me that when the Trust took the place over the house was crammed full of the couple’s reading material: it literally was stacked all over the place, their shelves having long since proved inadequate. On closer scrutiny of the books displayed, I discovered that most of them were titles printed after Virginia’s death. This kind of lack of attention to detail really infuriates me so when, later on, I was wandering around the garden and another kindly volunteer, dressed as who I can only assume was supposed to be Lytton Strachey, asked me if I’d like to listen to his reading of part of one of Virginia’s novels, I declined. 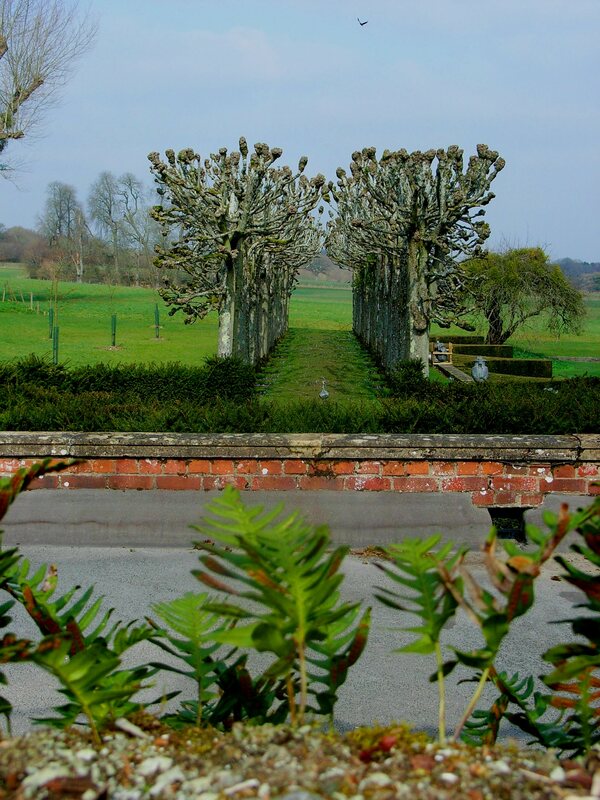 Above – two views of the stunning garden and out to the orchard behind. Beyond this is the river where, on 28 March 1941, Virginia drowned herself by wading out, her pockets filled with pebbles. 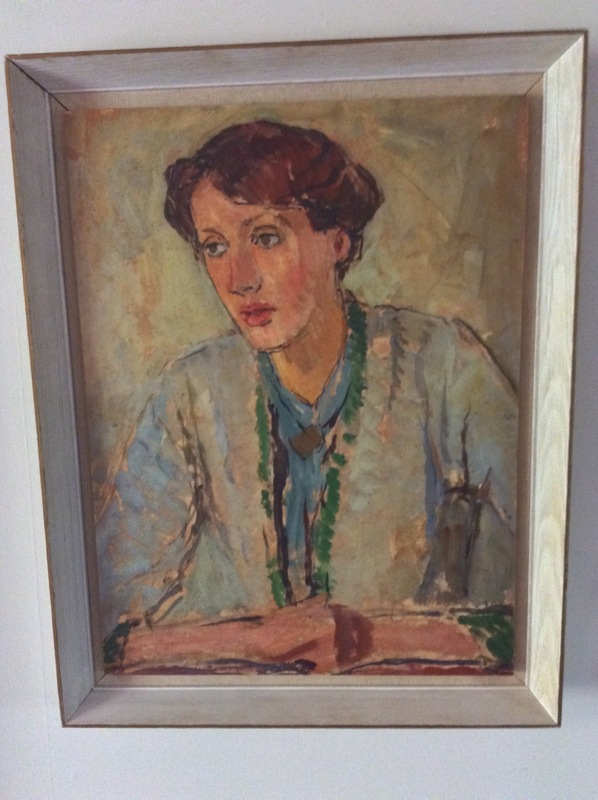 This painting of Virginia by her sister, Vanessa Bell, hangs in the living room of the house. I wondered what her state of mind was when it was painted. She has a troubled look doesn’t she? She struggled with depression all her life. As I left the peaceful village of Rodmell and drove home on a glorious early summer evening, I pondered the link between depression and the highly creative. It seems to haunt so many people who have brought great art (in whatever form) to the world. I found this article which made interesting reading. There is, it seems, a high price to pay for prolific creativity. It was half term a few weeks back. The SSF was away (on some sort of endurance test to northern climes, as it turned out) and I had unmitigated freedom to contend with. 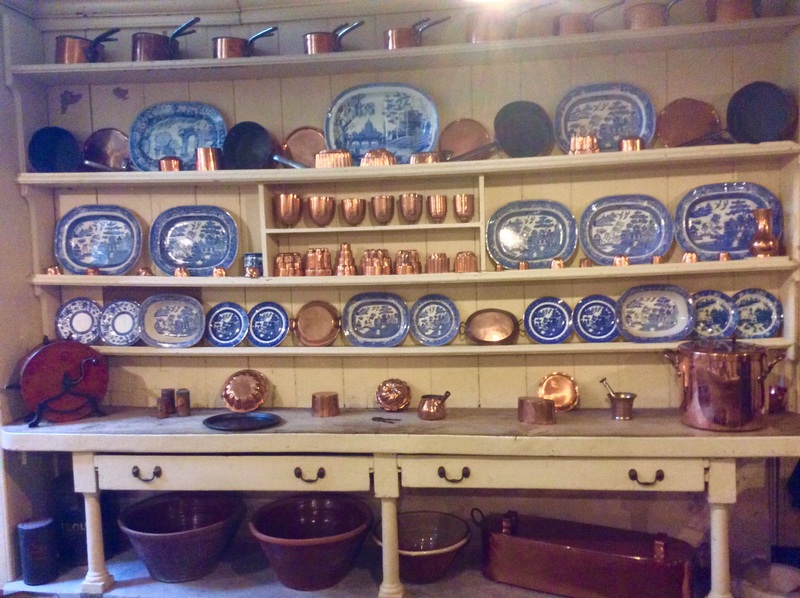 On a whim, I set about redecorating the kitchen. I like painting and I like orderliness. I was orderly. I was methodical. I wrapped my brushes in cling film every evening. Things were going surprisingly well until, after flicking through a few home design magazines, I had the brilliant notion of a ‘feature wall.’ I tried a few test pots out on designated wall, creating a Kandinsky-ish effect. The results were hideous. None of the shades I had chosen remotely resembled those advertised. This spontaneous need for colour injection had slowed my progress. Hastily I covered the mess with a calming neutral and decided an outing was required. I have a list of Places-I’ve-Been-Meaning-To-Visit. Checking through this by now extensive directory, the thought occurred that several sites I had highlighted belong to the National Trust. So, quicker than you could spit at the mention of Michael Gove, our new Environment Secretary (latterly the destroyer of our education system as we knew it), I performed a complete moral U-turn and decided to sign up for membership. I can’t believe I’m even admitting this, so critical of this institution have I been in the past. And still am and probably still will be. To explain fully the signing up scenario I’ll have to confess to a recent personal event. I had a birthday. A fairly monumental one as it happens but one that comes with a few welcome perks such as free prescriptions and eye tests, a national rail card and reduced price entry to practically everywhere. Everywhere it would seem, except the National Trust. After a lengthy drive eastwards to deepest Kent one morning, I arrived at my first planned property intending to join up there and then. However, wielding my driver’s licence as proof of age cut no ice with Miss Twinset who filled in my particulars. She very sweetly and ever so slightly smugly told me that to qualify for a Trust discount one has to have been a member previously for five consecutive years. Unusually I held my tongue, bit my lip and whatever else most people do in situations such as this while thinking that with age must come acceptance. I imagine if I’d have had a membership of anywhere for five consecutive years then the chances are I’d have done everything on offer pretty much to death anyway: what would be the point of a monetary enticement? I kept quiet. The new old me signed up meekly and, clutching my temporary pass in my gnarled old hand, I picked up a welcome pack which, I was horrified to discover, included an emblematic sticker for my car. I had now well and truly joined the ranks of those who frequent gift shops to buy local jam and tins of themed biscuits. 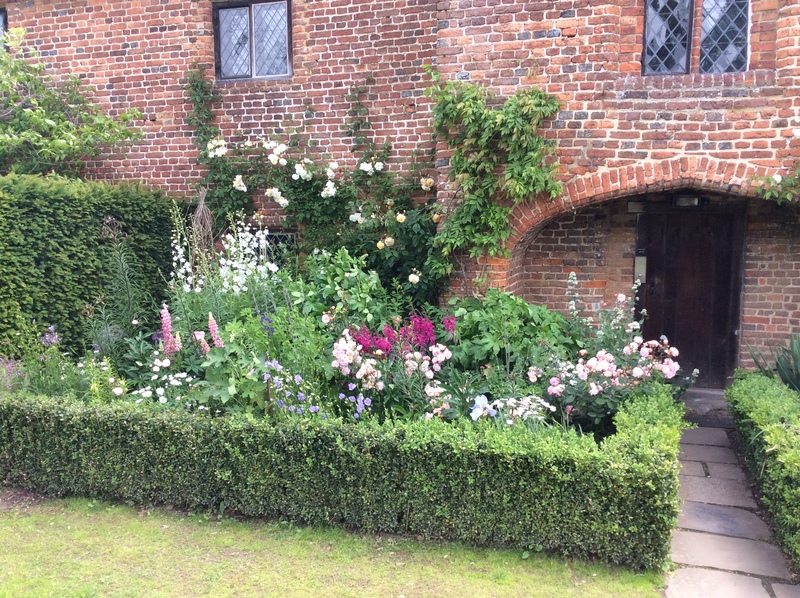 I had arrived at Sissinghurst Castle Garden, former home of poet and writer Vita Sackville-West and her diplomat and author husband, Harold Nicholson. The couple bought the place in 1930 and set about making a home for their family. 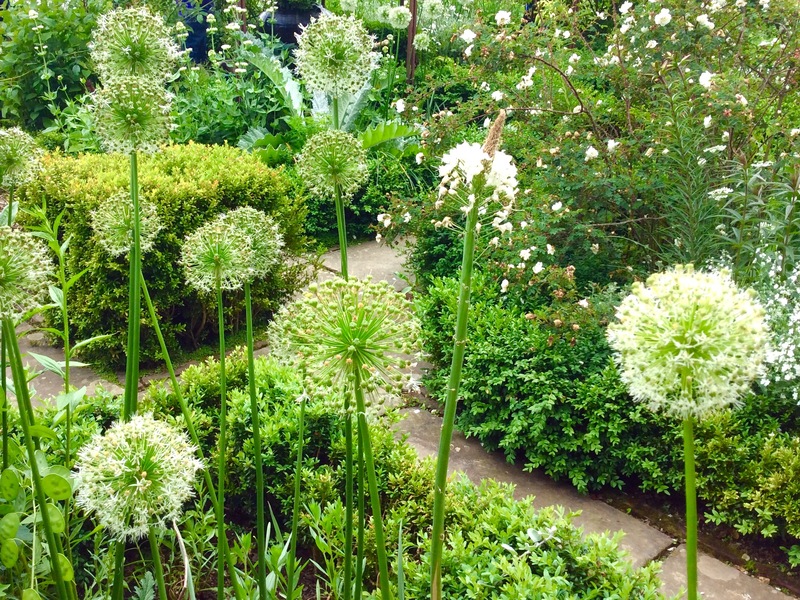 Vita developed her love of gardening here and took delight in planting, designing and experimenting. She lived a fairly wild existence, had many liaisons with other women and a decade long affair with Virginia Woolf but always remained married to Harold. When she died in 1962, Harold decided that her legacy should be preserved for us all to enjoy and left the place in the hands of the National Trust. I have to say, they’ve done a good job. The place is beautiful. It helped that the sun was shining and the day warm, but I spent two or three hours just wandering around the gardens and taking the long walk around the lake. I even had time for a quick lunch in the ubiquitous cafe before heading off to the next place on my list. But that’ll have to wait for another day. This membership thing may well catch on. I had a free day the other week – nothing planned, the weather was good and I felt like an outing, so I trawled through my Art Pass Guide to find somewhere to go that wasn’t too far away. 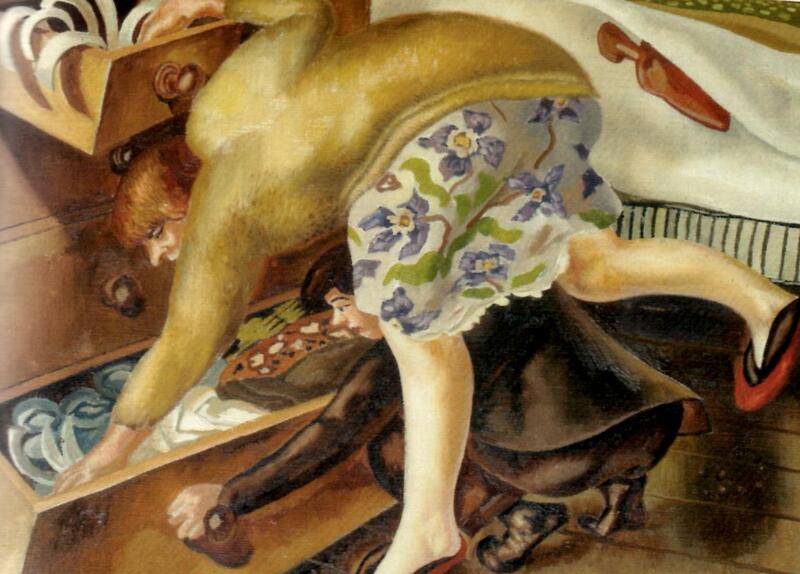 It didn’t take long for the name Stanley Spencer to jump out. I didn’t know much about him other than he was an artist (slightly eccentric) who’d had something to do with First World War paintings and who, according to family folklore, had taken tea with Dad’s artist cousin Walter Steggles on numerous occasions. It was time to check him out. 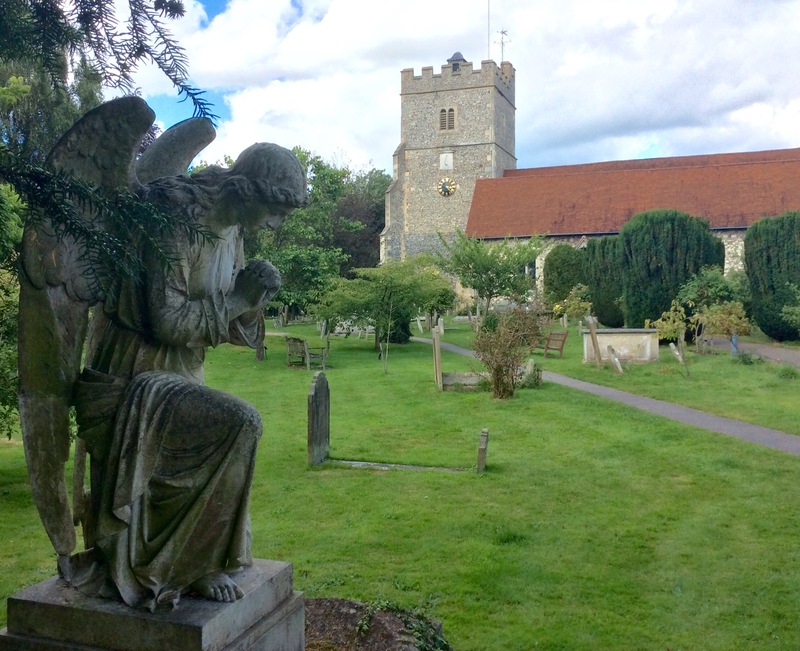 There is now a gallery dedicated to the man in his home town of Cookham in Berkshire so I consulted the map, checked the easiest route – there seemed to be several – and committed it to memory. I don’t have, nor do I want, a Sat Nav. While I know they can be an invaluable piece of kit, they are only as good as the programmer. They can default to the wrong place as we have discovered to our fury while touring in France and then Talking Woman gets increasingly agitated if you manoeuvre an unscheduled U-turn. So armed with a bottle of water, the map and my Art Pass, I set off. Fortunately my sense of direction is reasonably accurate because when I arrived at Maidenhead, the nearest large town to Cookham, the lack of road signage is unbelievable. In my mind’s eye I had pictured Maidenhead as a leafy, broad-avenued sort of a place, stuffed full of expensive designer shops and delicatessens with willows bending towards the Thames. Possibly people in punts. In reality it is more like how I had imagined Basingstoke to be. After an endless succession of round-a-bouts with choices to either go west for Reading or east for Slough (quelle horreur!) I ended up in a one-way system enjoying the sights of the multiplex cinema and a concrete shopping centre before thankfully peeling off through a residential area (still no signage) and ending up on the Cookham Road. Cookham, by contrast, is a delight. 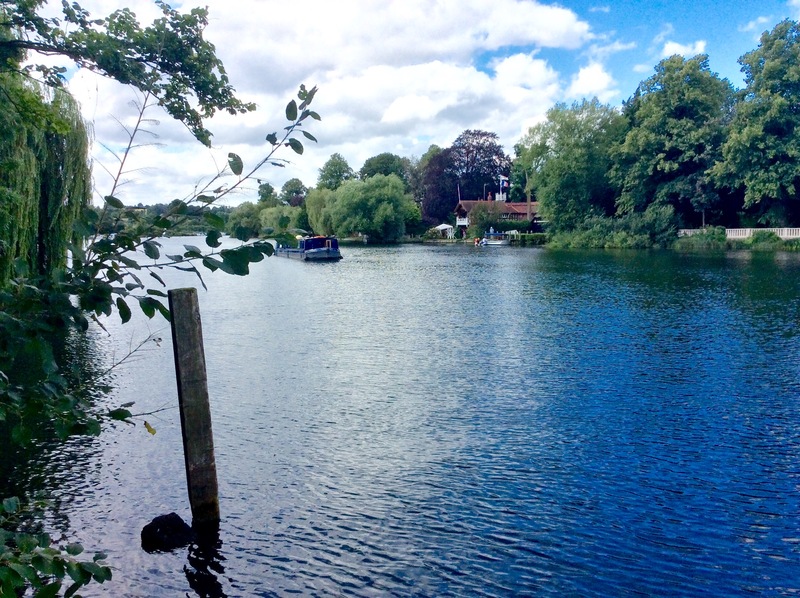 Not quite a town but too large for a village, Cookham sits sleepily beside the river Thames. There’s a church, a quaint little garage and the house in the high street where Spencer was born in 1891. Just along from this is the tiny converted Methodist Chapel which now holds a permanent exhibition of Spencer’s paintings. It is packed full of them but manages to maintain an effective layout with plenty of information. Upstairs on the mezzanine you can watch a video of his life and works which I thought I’d dip into but I ended up watching it all, it was so interesting. Spencer was quite a character around Cookham. 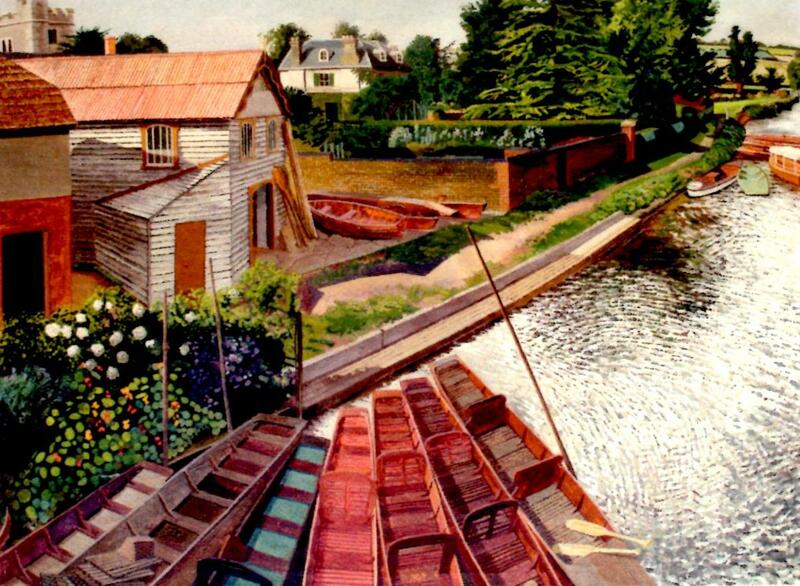 He’d often paint en plein air, lugging his artist’s materials around in his daughter’s old pram. Many of his paintings depict ordinary life around the town and he included actual residents – not always with permission! The exhibition I saw concentrated on his paintings of the natural world – I liked these – they are striking yet have a naïve quality. His colours are vibrant. 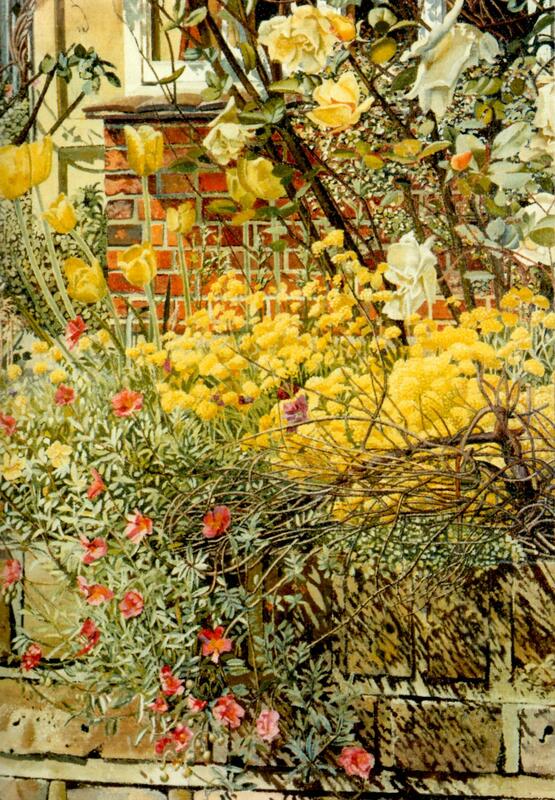 He was obsessed with gardens and what went on behind walls and hedges as well as using religious motifs and themes throughout his work. He married an artist, Hilda Carline, and they had two daughters. I was interested to see that one of his girls, Unity, has written an autobiography, providing an insight to living with this man but also who had had a very turbulent and artistic life of her own. Before I knew it, I’d spent two thoroughly enjoyable hours in this tiny space, studying the paintings and dipping into the freely available archive material. It was fascinating. I also discovered that the gallery opened in 1962 and was refurbished in 2007 through donations and a Heritage Lottery Fund grant which makes me feel that my purchasing of a weekly lottery ticket isn’t entirely wasted. The gallery is now a charitable trust, staffed by very knowledgeable and enthusiastic volunteers – I’d definitely recommend a visit and will more than likely return as long as I remember to avoid Maidenhead. 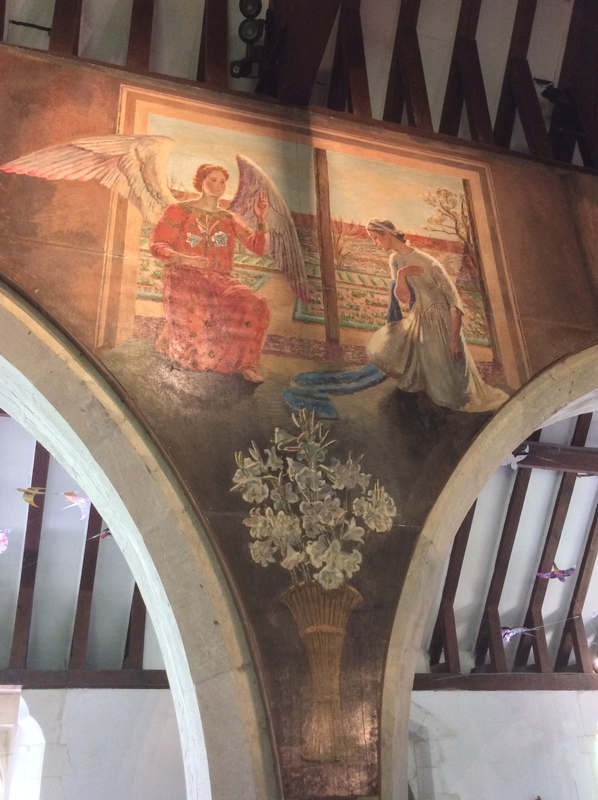 While at the gallery I learned that Spencer had been commissioned to create a series of murals at the Sandham Memorial Chapel in Burgclere, Hampshire and I was keen to visit. Spencer had enlisted in the Medical Corps during the First World War and these murals depict personal experiences of everyday life both in hospital and on the front line. The work, inspired by Giotto’s Arena Chapel in Padua, took him almost six years to complete. 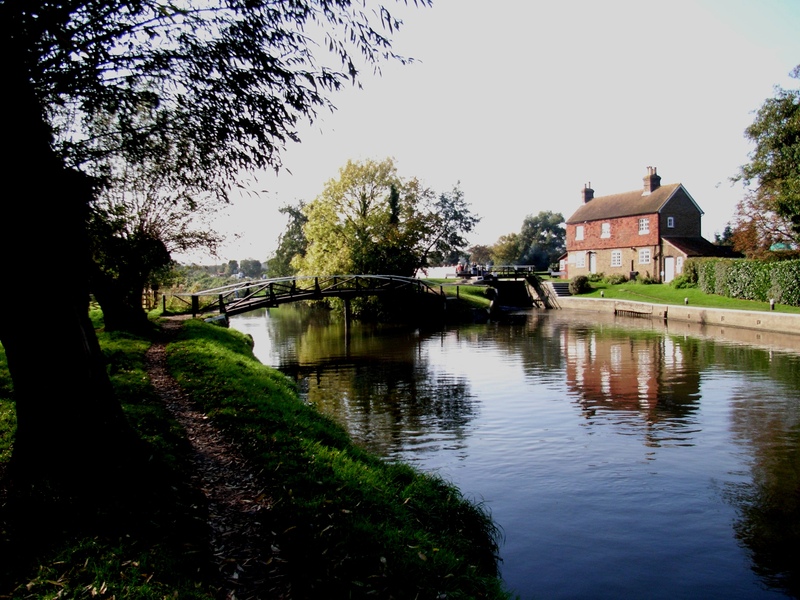 Now, you may remember that my last post covering the Silk Mill outing took the SSF and me into deepest Hampshire, so it seemed the ideal opportunity to call in to Sandham on the way home. Which is what we did: the SSF is very accommodating. So after the Mill, we hunted down this tiny chapel, which wasn’t easy due once again to poor signage. Anyway, we eventually found the place opposite a reasonable looking pub where we stopped for a sandwich before we wandered into the chapel grounds. Sandham is run by the National Trust. Their properties have a formulaic uniformity to them. The volunteers are of a type. The gift shops have a certain layout and although there are often local items available (pots of jam or honey, usually), once you’ve seen one, you’ve seen them all. They all sell tartan picnic blankets and small useless wicker hampers emblazoned with the Trust logo. They sell erasers in the shape of green welly boots. You get the picture. Unless you are a Trust Member (I am not), entry fees are expensive. Some are extortionate. Sandham falls into the latter. Occasionally my wonderful Art Pass will cover a Trust property. I always proffer my card to the volunteer cashier (sometimes I’m lucky) but usually it is regarded with snooty disdain and I’m offered the obvious alternative with a smugness that is definitely a Trust requirement – signing up there and then to become a Member. No thanks, I always say, wanting to add that I have no desire to add to their coffers which in turn allows them to turn our beautiful old heritage homes into themed opportunities with borrowed furniture of the time, contract carpeting and a re-enactor in every room. No thanks, if it’s all the same. I’m stared at as if I’ve just insulted their religion, which in a way, I suppose I have. Grudgingly I shelled out my £10 entry fee while being thankful that SSF got in for nothing because she is a member (and I don’t hold this against her. Each to their own). A small room sporting story boards gives the visitor some brief information about the commissioner and Spencer’s work before you can then watch a short video doing much the same. Then you can get into the chapel itself which, I have to say, does provide more than a gasp factor. The place is naturally lit, the light being constantly regulated by a volunteer opening and closing blinds all day. The art work is truly amazing – the detail and extent of the work is breath-taking. These are all war paintings but not of suffering particularly, but of hope. Spencer apparently felt that toil would move him closer to God, something he strived to do all his life. 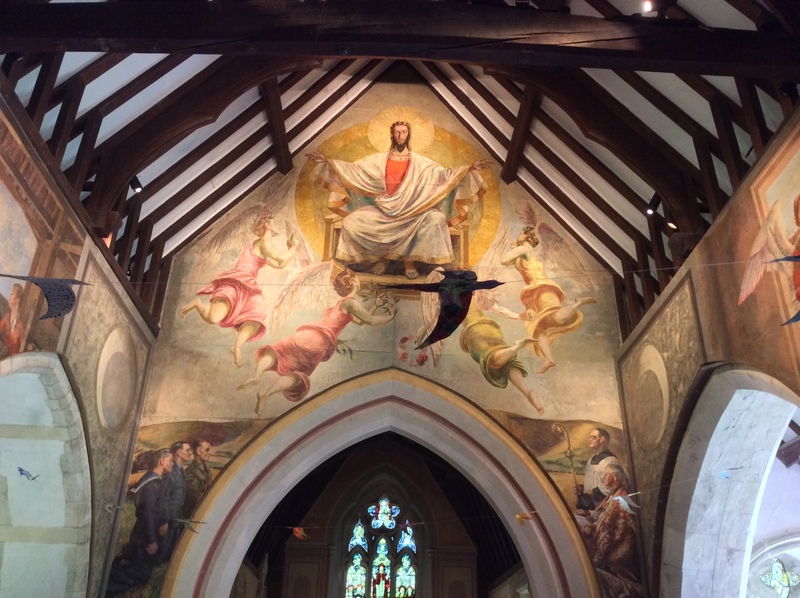 Our visit to Sandham probably lasted for a maximum of forty minutes and while I’m delighted to have seen these murals, £10 is still far too expensive. To cap it all, I was warned by Light Regulating Woman not to take photographs, so if you’d like to get an idea of Spencer’s vision, click here for a link to an article in Apollo Magazine. 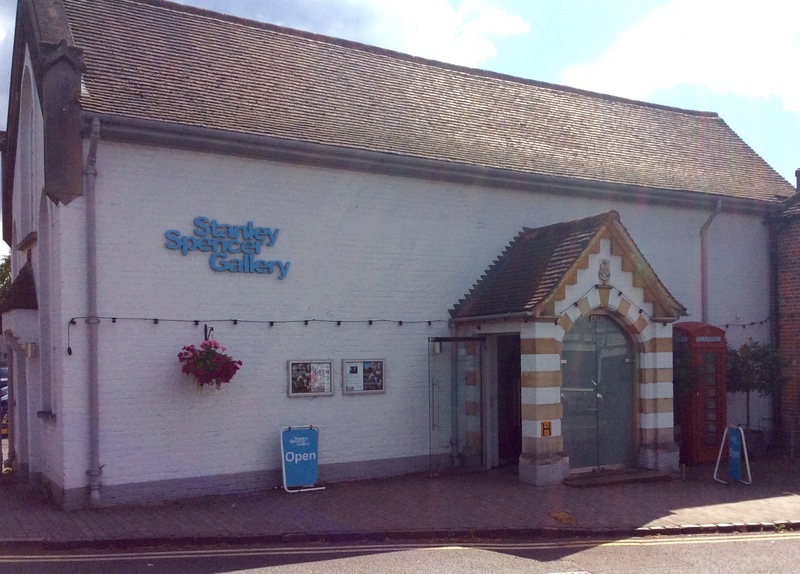 Ah well, the Cookham Gallery was completely free to me, an Art Fund Member. Guess you can’t win ‘em all! Incidentally, the photos in this post of Spencer’s paintings have been scanned in from the very excellent guide book I purchased from the gallery in Cookham for the very reasonable sum of £5. When I started my first school, at the age of five, Dad seemed very excited to hear that I had been placed in “Churchill” – one of four houses our tiny school was divided into for Sport’s Day events or collecting merit points. The houses were each designated a colour and I was to wear blue webbing bands which, because blue was – and still is – my favourite colour, pleased me more than its name which at that time held little significance. 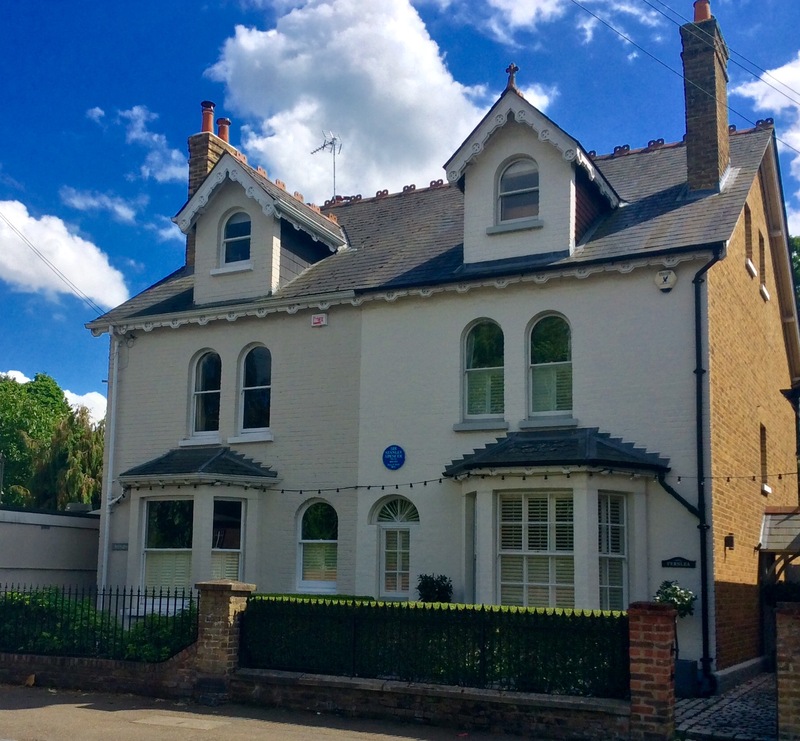 The houses were named after famous local residents – and Winston Churchill had his country retreat less than five miles away. As children we drove past the place often; were taken there for outings; were told stories of a great man who had lived there. During the war Dad was a despatch rider for the Royal Signals. He would regularly make trips to Chartwell to deliver documents or papers and of course always held Winston in very high esteem. 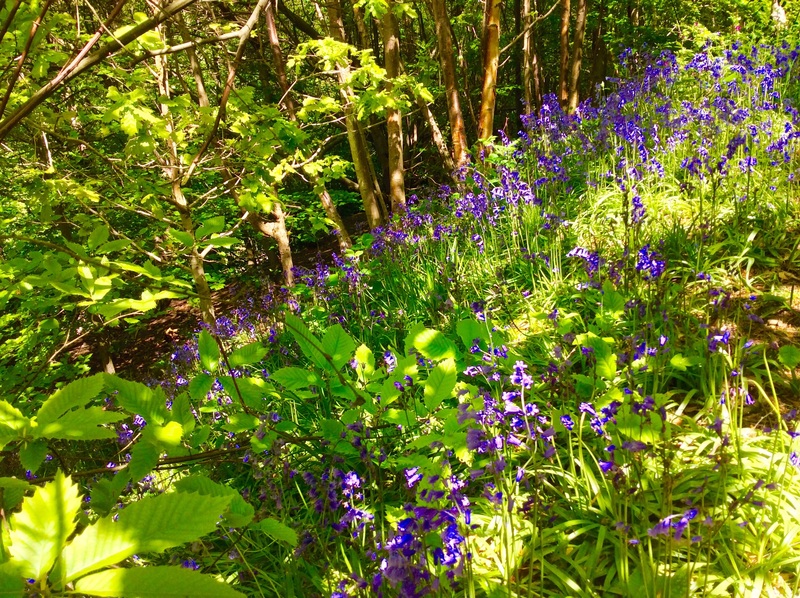 He got to know that part of the countryside pretty well and it is probably part of the reason he decided to buy the virtually derelict house he did in the 1950’s which was to become our family home for over thirty years. This year marks the fiftieth anniversary of Winston Churchill’s death. Time, then, to revisit. 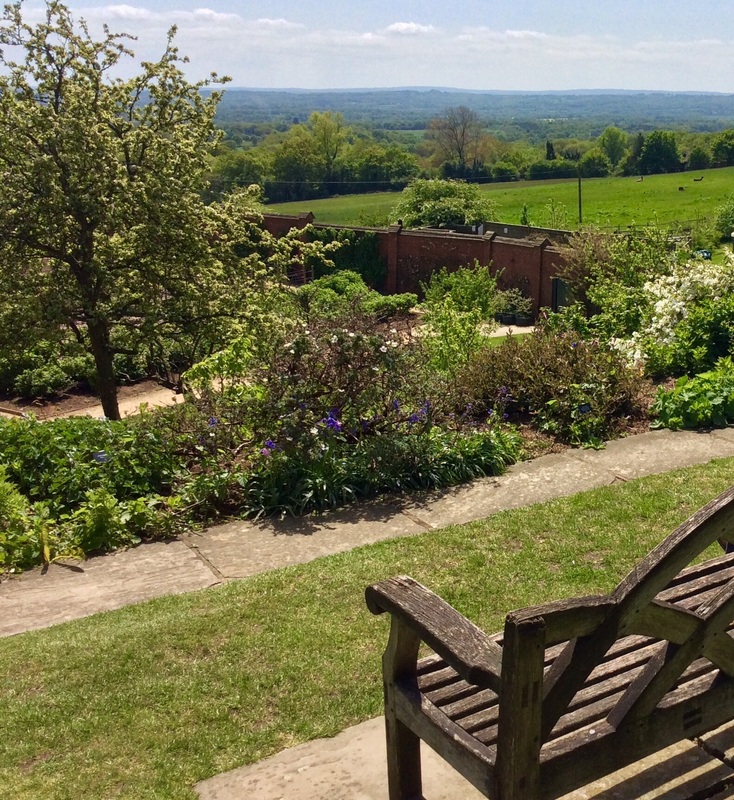 Chartwell sits behind a high stone wall down a narrow winding lane with far reaching views across the Kentish Weald. 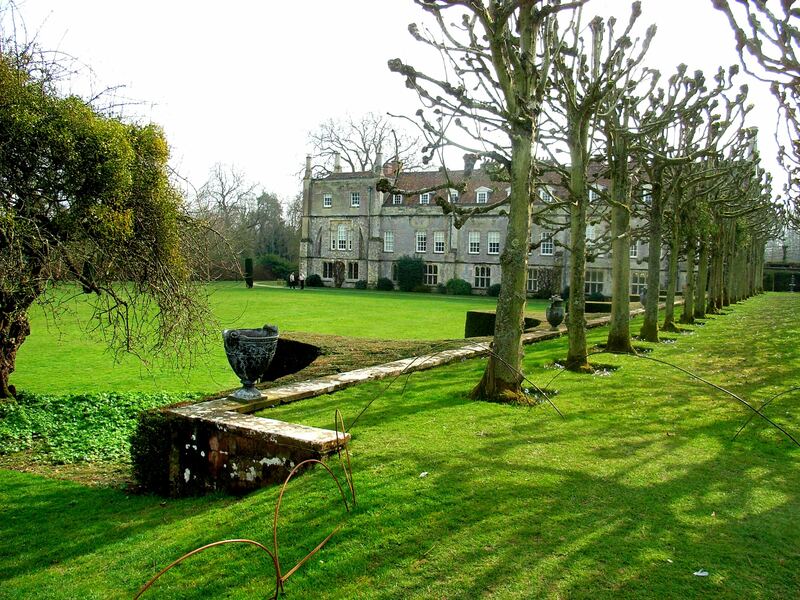 Winston bought the place in 1922 and it provided a sanctuary for him, his wife Clementine and their children away from London and matters of state. When World War Two ended in 1945 the Churchills were not confident they could afford to keep the place going but a consortium of friends got together and shored things up for them with the proviso that the property be bequeathed to the National Trust on the deaths of Winston and Clementine. 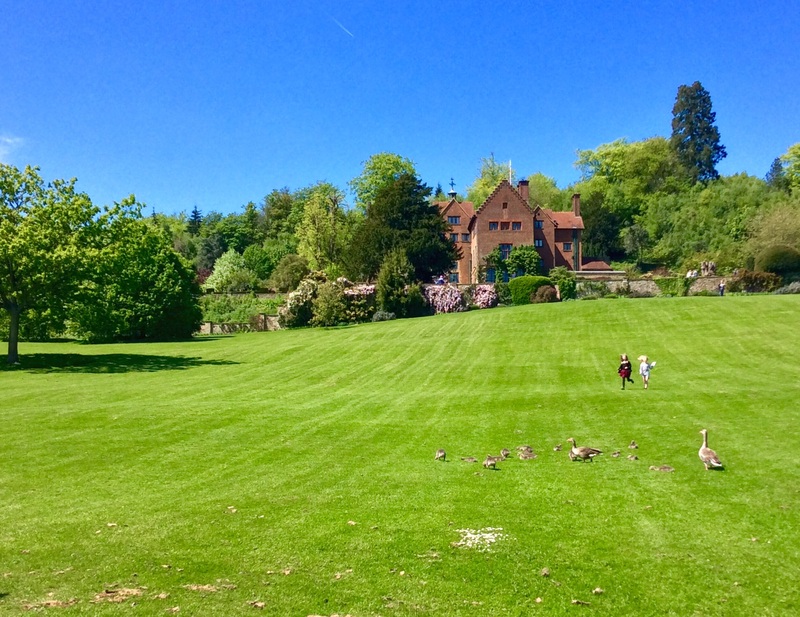 The Trust is now custodian of this quirky yet highly personal house and its magnificently sweeping gardens and I’m pleased to say that I was able to gain free entry for two using my marvellous National Art Pass. Our walk started with a gentle stroll down towards the lake where black swans can be spotted if you’re lucky. 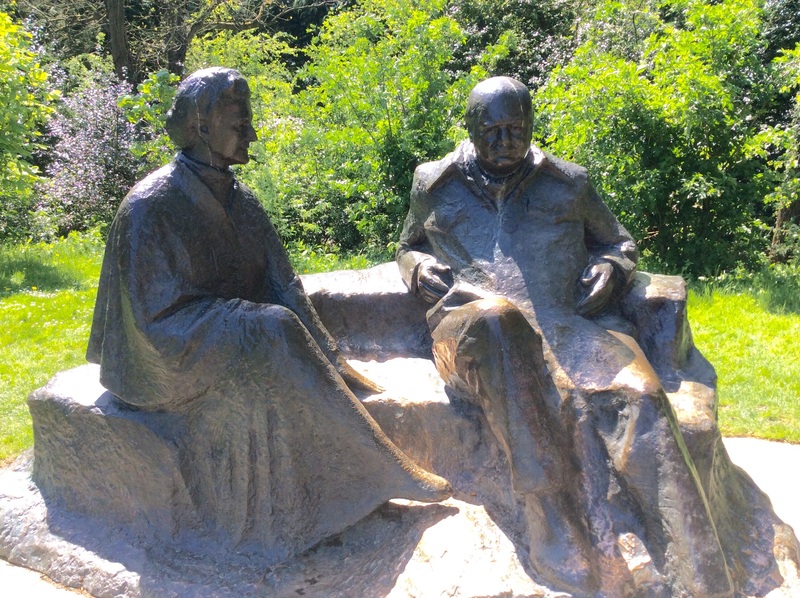 Following a rough path around the water’s edge brings you to a small clearing where a sculpture of Winston and Clementine Churchill is situated showing them sitting together looking towards their beloved house. The art work is by sculptor Oscar Nemon and was unveiled by the Queen Mother in 1990. Carry on past the sculpture and you reach wild woodland to the south-east edge of the estate. The path here winds uphill through beech and bluebell woods to where a unit of Royal Canadian Engineers camped out during World War Two. 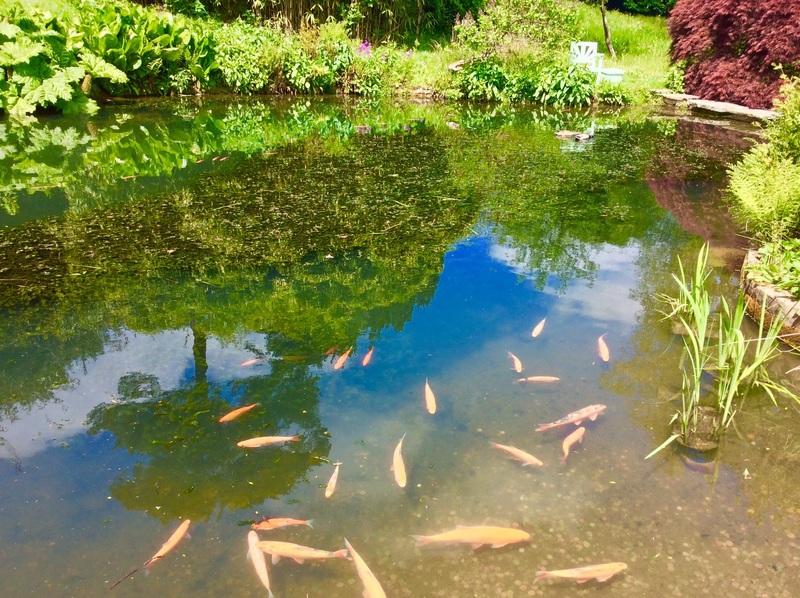 These troops set about camouflaging Chartwell, hiding the swimming pool, draining the reservoir and disguising the lakes with brushwood, keeping the place safe from possible aerial attack. Apparently Winston was mightily relieved that his precious goldfish were not in immediate danger. Returning downhill from the site of the Canadian camp, the house comes into view across the fields and sloping lawns. 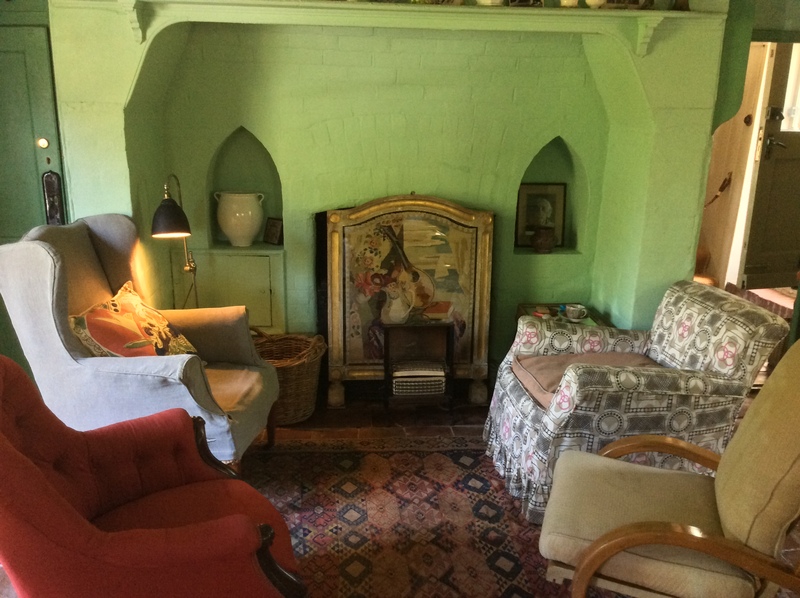 Inside, the house is a delight – the rooms have been maintained almost as they would have been when the Churchills were in residence: some personal things remain – Winston’s slippers, for instance. 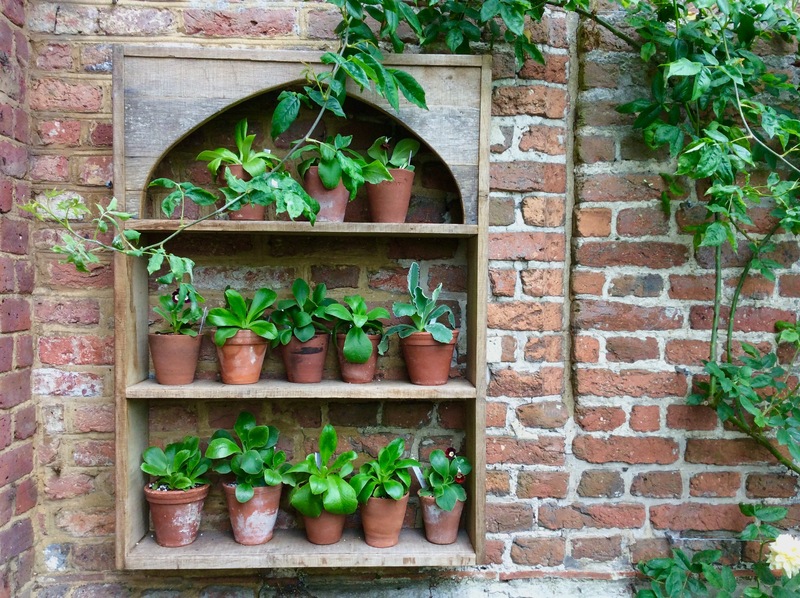 Sadly, photography is not allowed, but you can click here to view interiors from the National Trust’s website. 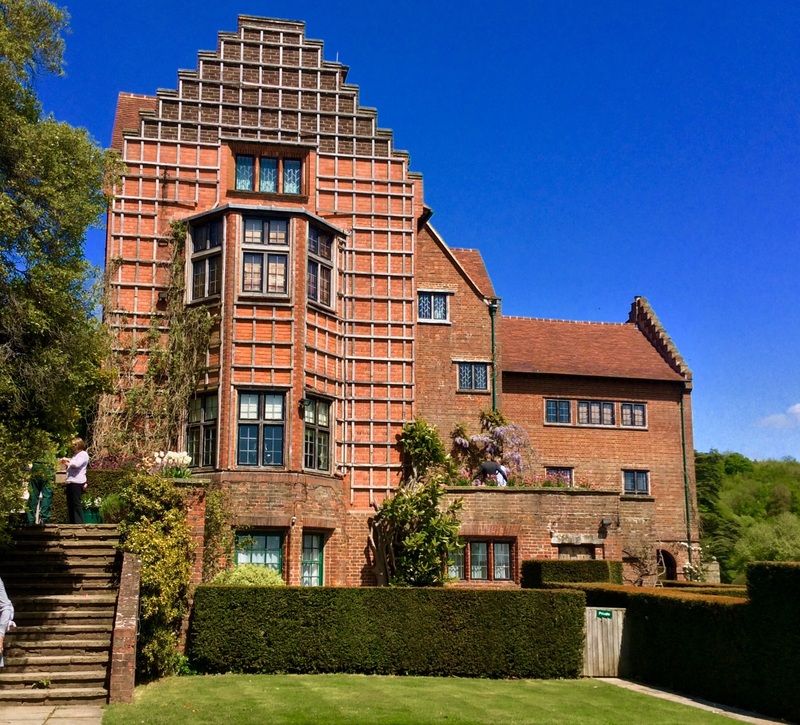 According to the National Trust’s blurb the house is ‘of little architectural merit’ having been added to and changed over the years by various occupants – Churchill included. When he bought Chartwell he opened up some of the darker rooms by installing large casement windows, making the most of its position overlooking some of Britain’s finest green and pleasant land. It was this view that enticed him to Chartwell in the first place and one of which he never tired. This view point overlooks the miles of rolling countryside stretching towards the English Channel that fired Churchill’s fierce resolve to keep Britain safe from invasion. In the centre of the photograph is the wall around the kitchen garden which he helped to build – at a reported two hundred bricks a day. 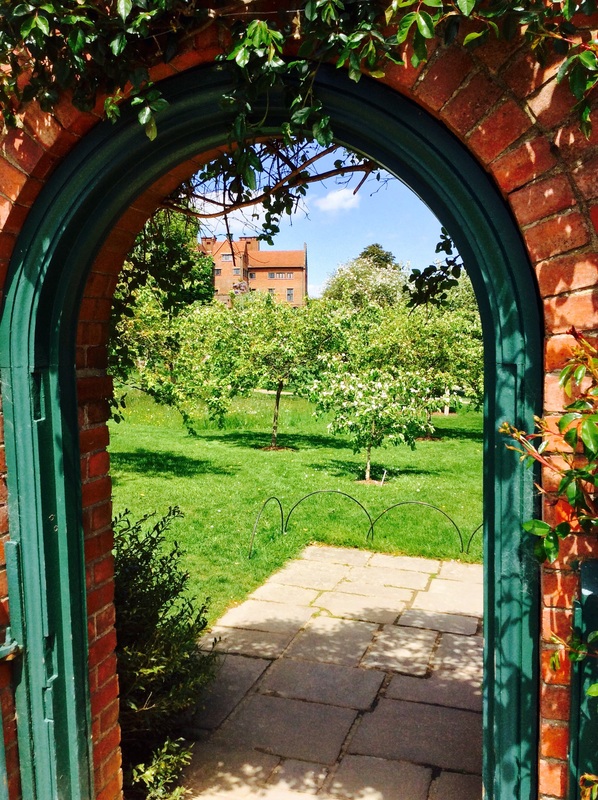 Through the arched gateway is Winston’s art studio, left as if he has just popped out for an amble around his garden. So much has been written about Churchill: his policies, political leanings, the crossing twice of the House of Commons from Conservative to Liberal and back again, his failures and his triumphs, his family, his speeches and most of all his determination to never surrender to a Nazi invasion. Without his dogged and ruthless determination to plan and implement the Battle for Normandy, which the French will be commemorating this weekend, the course of the war would no doubt have been different. And while we cannot forget the tremendous sacrifice made by Allied troops on D-Day – 6th June 1944- and in the days following – perhaps a silent salute to Winston wouldn’t go amiss. Enjoying your freedom? Thank a veteran. Imagine losing all your precious possessions in a major disaster. What would you rescue? Photographs? Your computer? Your jewellery? I know what I’d grab first but this isn’t about me. (If you’d really like to know what I’d save, click here – I wrote about it a while back). 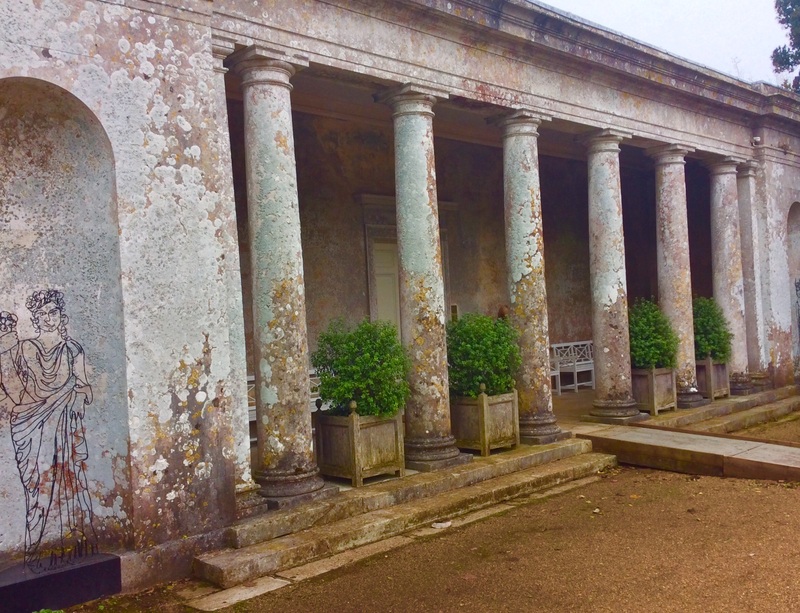 Last week we visited Uppark, a Georgian stately home completely devastated by a monumental fire in 1989 when a builder, finishing off repairs to the lead flashings on the roof, had an accident with a blow torch. Pictures, treasures, furniture and tapestries were pulled from the wreckage. The unfortunate builder’s insurance eventually coughed up £20 million, providing the wherewithal for the National Trust to undertake a major conservation project. Six years later, in 1995, the house had been restored to its former glory and re-opened its doors to the public. It’s taken us since then to travel the twenty miles or so to check it out. It was the restoration rather than the history of the house that interested me – I’m not usually that bothered about mooching around former homes of the upper classes who, having fallen on hard times or wanting to avoid inheritance tax, bequeath their stately piles to the Trust in return for modest accommodation somewhere on the site. However, for those who like a little historical content, the house was purchased by one Matthew Fetherstonhaugh, the son of a baronet, in 1747. He then married into the Hugenot family so between them, he and his wife were not short of a bob or two. They embarked on the Grand Tour – a rite of passage for all the wealthy, ox-bridge educated elite of the time. This was a lengthy tour of cultural Europe, ostensibly undertaken to widen horizons and educate but what it did was allow our monied gentry to purchase works of art, furniture and the like to fill their stately homes after indulgently sampling everything else the continent had to offer. (And our kids thought they invented the gap year – pah!) 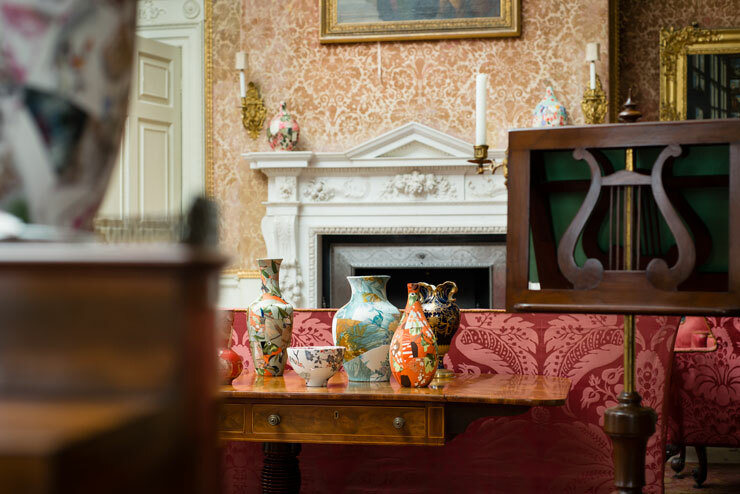 Over two years the couple amassed a wealth of artworks with which they decorated Uppark. The years passed by, the house was left to Matthew’s only son Harry who lived a riotous life. He had a brief but torrid affair with a teenager called Emma Hart who lived at Uppark with him until she became pregnant and then he sent her packing. She would later become Lord Nelson’s infamous Mrs Hamilton. The Prince of Wales was a frequent visitor to Uppark where he followed such pursuits as gambling, shooting and hunting. 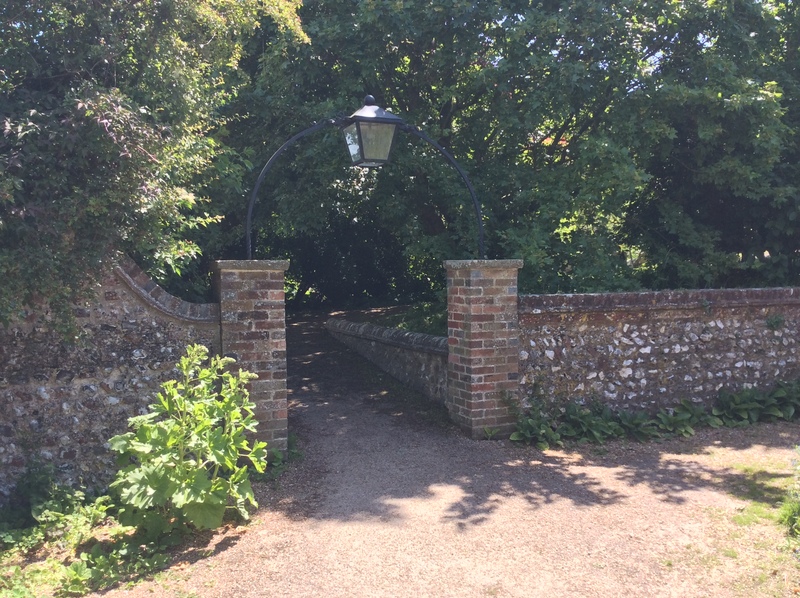 Through this royal connection Harry met and befriended the designer Humphry Repton who was responsible for adding the front portico,the dairy block and the stables to Uppark. At the age of seventy, Harry married his dairymaid, Mary Ann, and the couple lived together until his death twenty years later. She inherited the house and her descendents have lived there ever since, passing Uppark into the hands of the National Trust in 1954 while retaining part of the house for their own use. 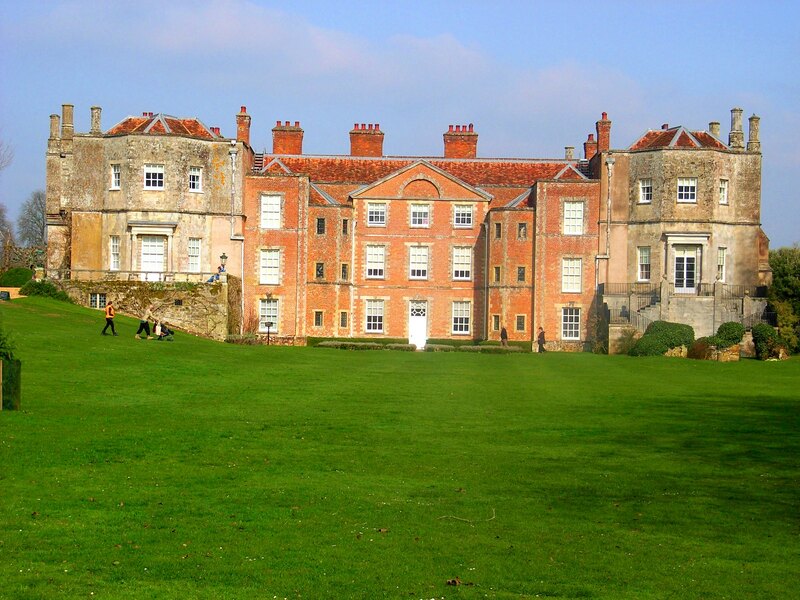 So, other than providing us with an example of how the wealthy lived in those days, has Uppark actually left the nation with any kind of legacy? Well, yes, because below stairs between 1880-1893, HG Wells (the author) lived briefly with his mother, where she was employed as the family’s housekeeper. 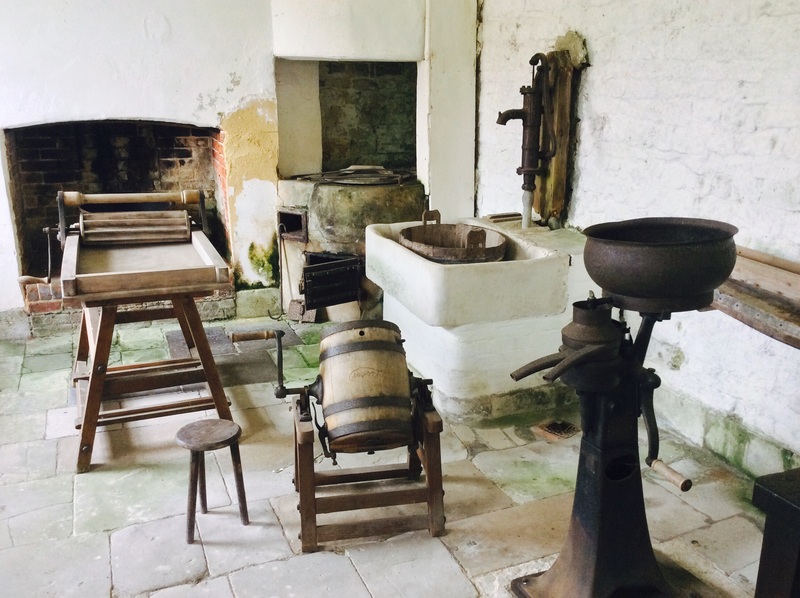 It is thought that he gained inspiration for his novel ‘The Time Machine’ while playing in the tunnels that linked the old kitchens at Uppark to the main house. 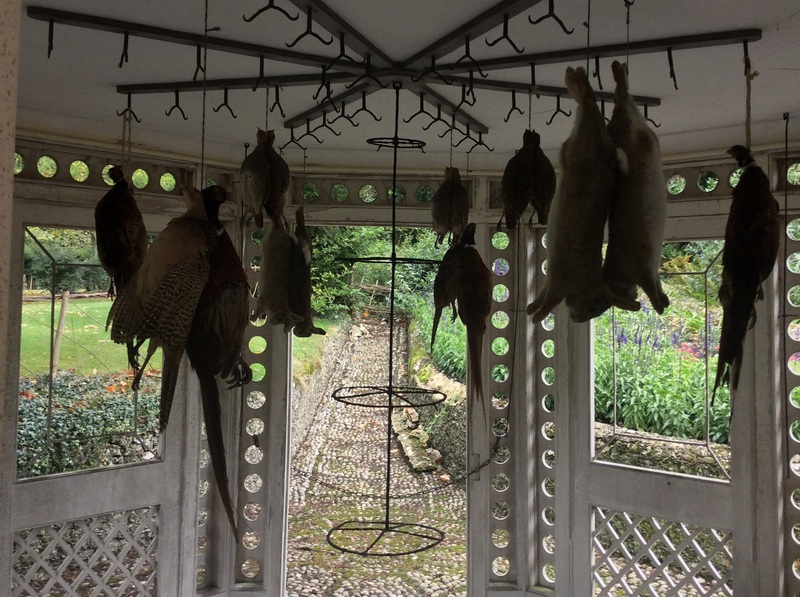 Running currently at Uppark is a modern art exhibition whereby thirteen artists have been commissioned to respond to moments and events reflecting the history of the house. Each room houses one of these art works and it was fun to spot them and work out their significance. 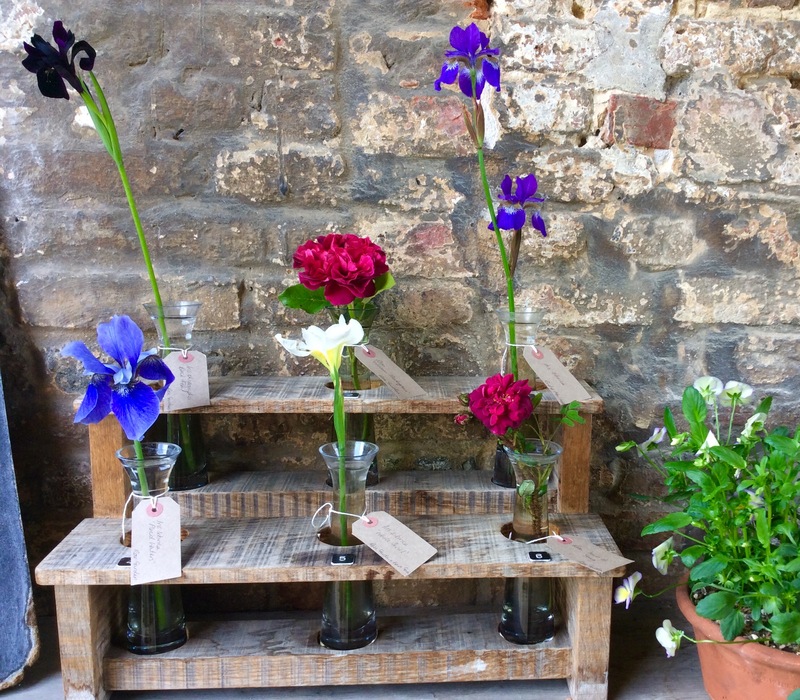 My favourite were the ceramic patchwork vases created by Zoe Hillyard displayed in the red drawing room. They added a splash of colour, they looked like ceramic pieces stuck haphazardly together but on closer inspection it is revealed that they are made from fabric off-cuts stitched together like a patchwork quilt. A little reminiscent of Grayson Perry’s ceramics – which is probably why they caught my eye. This exhibition finishes on 2nd November but is worth catching if you can. Since reading Gwen’s post on aging last week, something has occurred to me. I am now doing things that two or three decades ago, I wouldn’t have dreamt of: visiting stately homes for instance. Perhaps I should clarify what I mean by stately home. First of all, I don’t mean houses that have belonged to someone famous, such as Winston Churchill, Henry Moore or Agatha Christie. These places have meaning and are a delight to visit because they provide us with a glimpse into the worlds and therefore minds of their owners. No, I mean the ones that have been bequeathed to the nation by the families of the once very rich but now unknown socialites who think the rest of us will be interested in the history of their dysfunctional families, but in truth are trying in some way to recoup the enormous bill left by the death duties of their forbears. So when my friend (the sea-sick one who valiantly accompanied me on my boat trip down the river Thames to view the Barrier), suggested a day out at Mottisfont in Hampshire, I wasn’t immediately jumping with excitement, until she went on to explain that it was also the venue for an exhibition of the photography of the late Patrick Lichfield. Famous for the official royal wedding pictures of Charles and Diana, as well as many celebrity portraits, this is the first large scale exhibition to document Lichfield’s work from the 1960’s right up to 2004, the year before his death. Lichfield himself is no stranger to hereditary wealth and title. He inherited an earldom and huge estate in Staffordshire – Shugborough – from his father. During his life time he turned its ownership over to the National Trust (who cannily leased it for 99 years to the County Council), while he maintained an apartment in the house and kept a keen eye on the running of the estate. Now, I’m not a huge fan of our National Trust (I may have mentioned this several times before. I make no apology), but I have to concede that this is a clever way to get the punters in. A series of rooms on the top floor at Mottisfont have been converted into a spacious art gallery where a series of exhibitions can be viewed throughout the year. The Lichfield show comprises over fifty portraits of celebrities, ranging from Pele to the Queen, some in colour, others monochrome. Visitor photography is prohibited in the galleries, but you can see a sample of Lichfield’s work here. Some of his photographs are so well known that they come as no surprise – like the informal snap of Mick Jagger and Bianca in the back of their wedding car – but others, such as the Queen leaning over the railings of the royal yacht or Princess Margaret surrounded by adoring young things on her holiday island gives the visitor a glimpse into not only Lichfield’s world, but also to his mastery behind the lens. 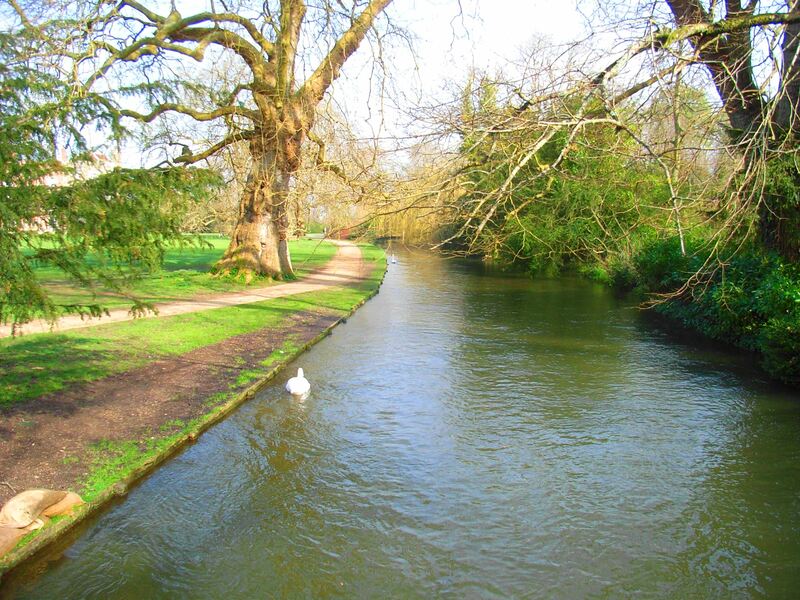 Mottisfont is situated in Hampshire alongside the River Test, a beautiful meandering chalk stream famous for some of the finest fly fishing in the country as well as featuring in Richard Adam’s novel, Watership Down. 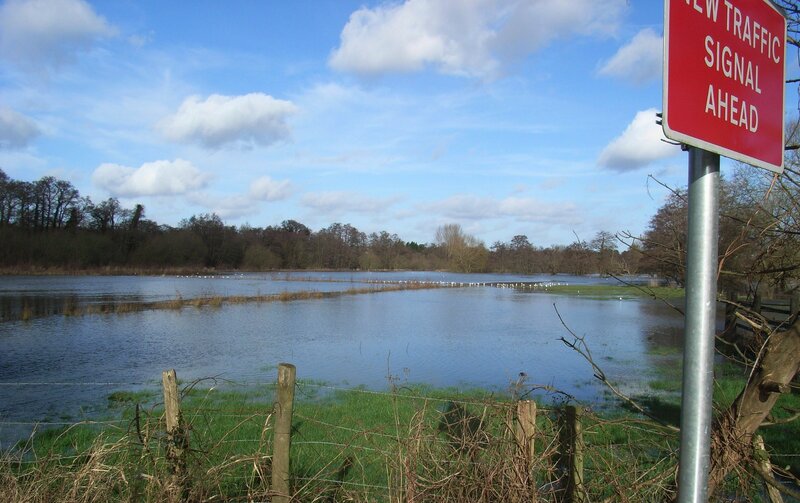 As we drove along the lanes, through the Somborne villages approaching Mottisfont, there were still signs of the recent flooding: sandbags piled high, diversions in place – fairly deep extended puddles to navigate – I glanced sideways at SSF (Sea Sick Friend) to make sure she was coping with all this unexpected water. 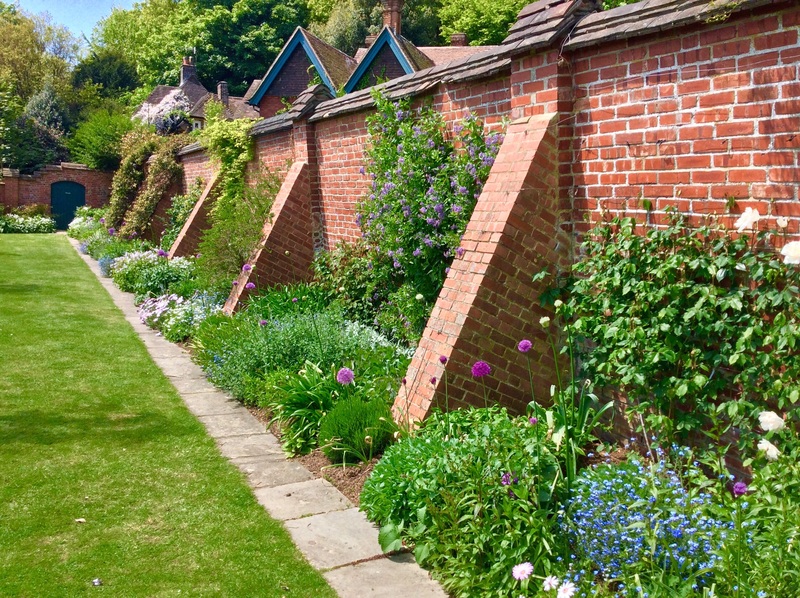 Our first priority on a day out like this, on arrival, is to locate the coffee shop, which in the case of Mottisfont, is round the back by the tradesman’s entrance, in the old kitchen. The coffee is good and the selection of homemade cakes and scones are tempting. We reined in gluttony by sharing a substantial teacake before starting our tour of the house. 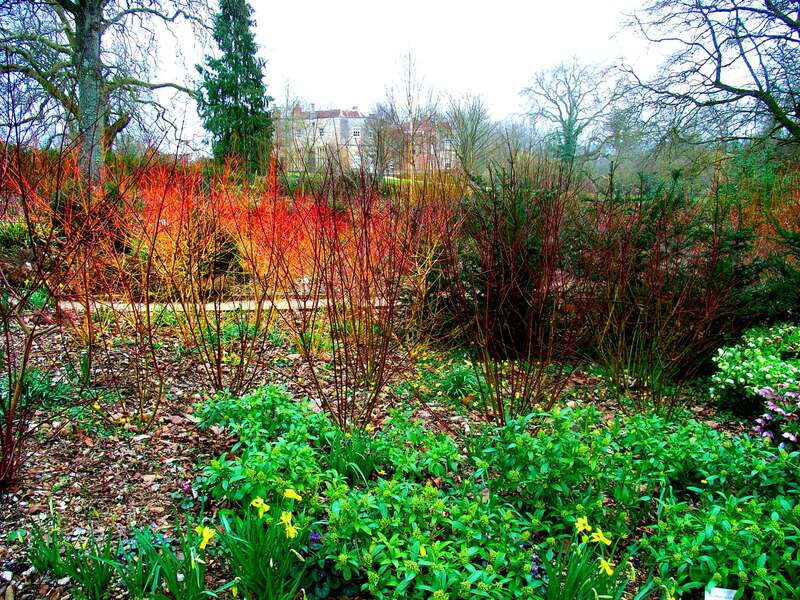 The National Trust has looked after Mottisfont since 1957 when the owner, Mrs Maud Russell passed it to them. She, like Lichfield at Shugborough, continued to live in a section of the house until 1972, when she moved to smaller premises in the village. 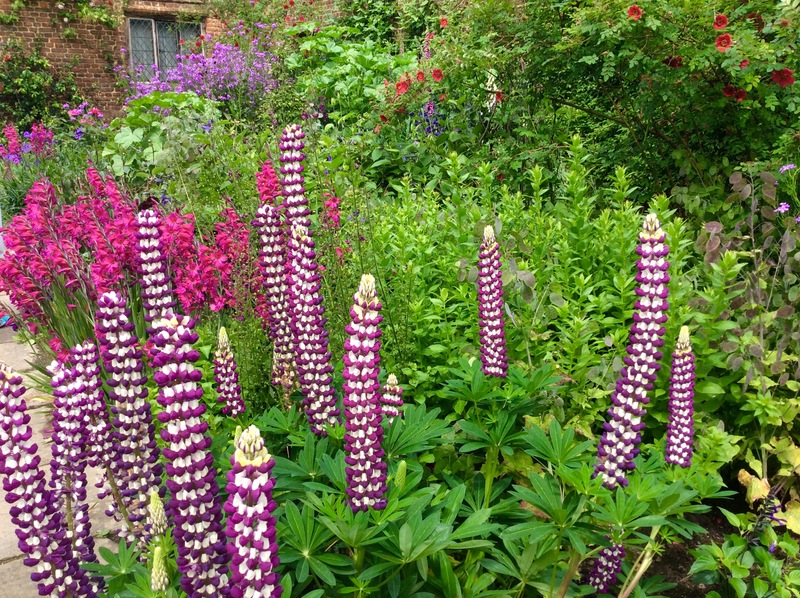 She and her husband Gilbert bought Mottisfont in the early 1930’s, beginning a program of restoration on the house which had fallen into disrepair. The house became an oasis for artists, writers and philosophers; Maud’s weekend parties were apparently legendary. As we toured the house it became evident that Maud Russell, while being incredibly wealthy, was an avid art collector. She owned pictures by Picasso, Degas and Modigliani. 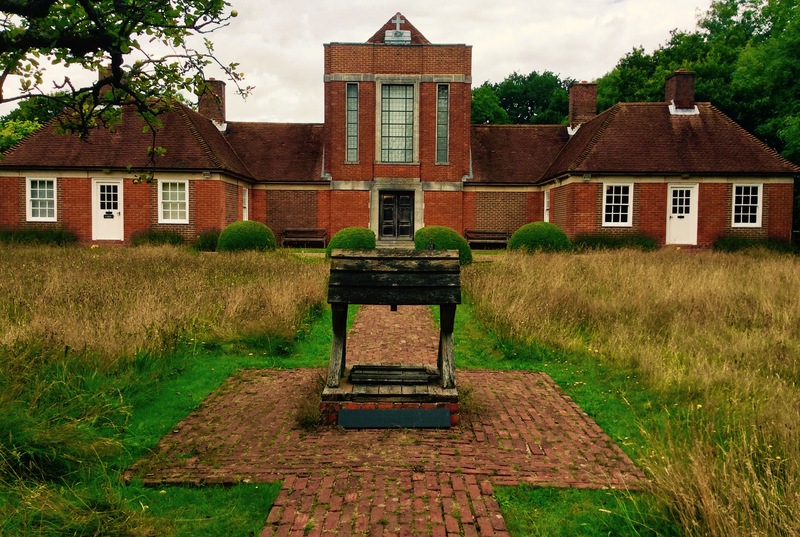 We spied works by Lowry, Ben Nicholson, Matisse and Pasmore. The art works are jumbled up along the dark hallway, in the reception rooms and the bedrooms. It is necessary to pay close attention in case you miss the Piper and the Hepworth. Maud Russell’s collection is revelatory. So what, you may wonder, is my beef with the National Trust? It is that the houses of which they are custodians become institutionalised; there is a common theme threading through nearly all of the properties I have visited. Although Maud’s paintings were there for all to see, there was no feeling in the house of Maud, the woman, her family or of the social whirl in which she lived. The Trust takes these houses on and yes, they preserve them but the essence of their former owners is gone. Original fixtures and fittings go and in their place the Trust put in ‘furniture of the period;’ they create libraries with fake book spines glued to the walls to create the illusion that the last incumbent was intellectual and they put down fitted contract carpeting. I am well aware that my gripes probably put me somewhere on the A spectrum, but I do like things to be correct – and this so patently isn’t. 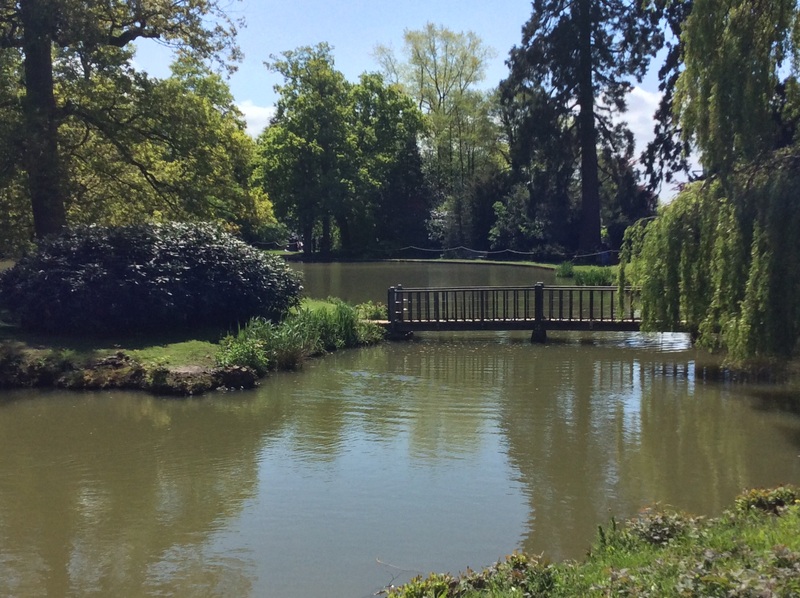 After returning to the cafe for a spot of lunch – very good, wholesome food – we took a wander around the grounds. 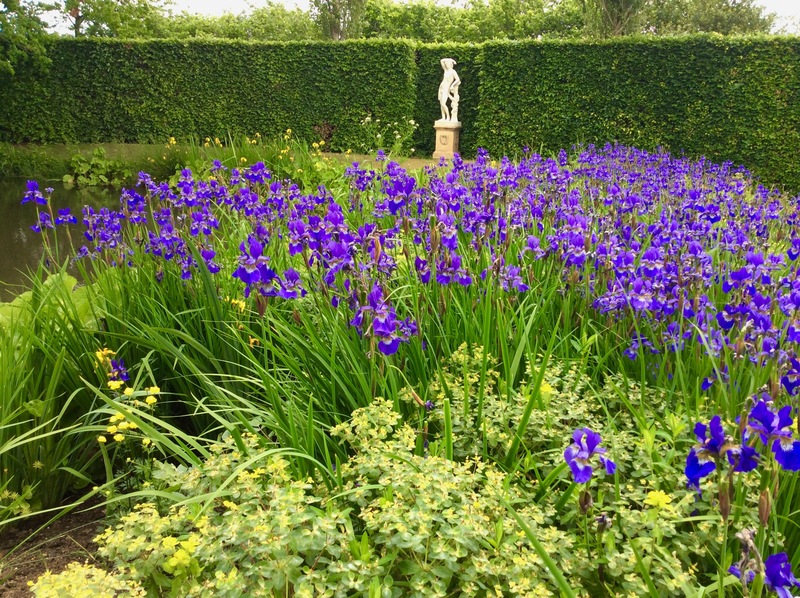 The gardens here were created by several landscape artists, all friends of Maud, including Geoffrey Jellicoe who designed the pleached lime walk and Norah Lindsay, the Tudor parterre. 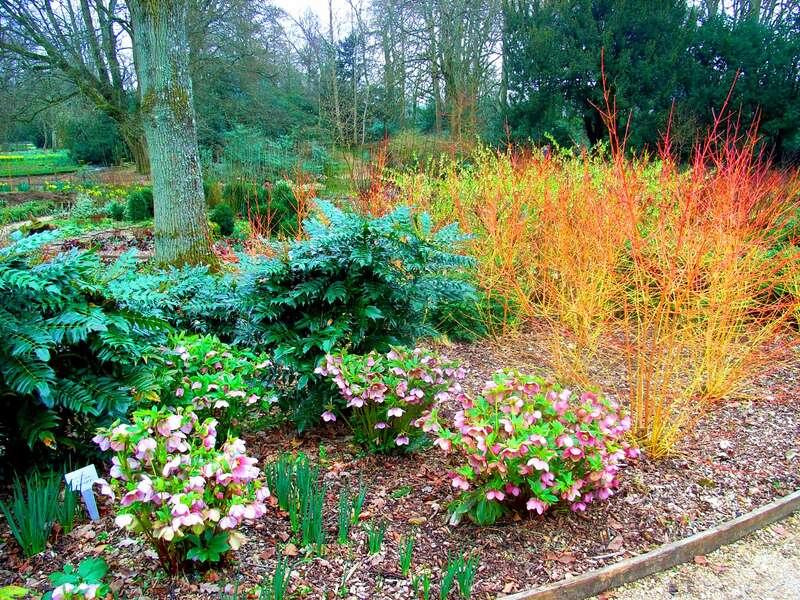 My favourite part of the grounds however, was the little winter garden, where soft heads of hellebores were out in full bloom contrasting with the stark, flaming stems of Cornus sericea and miniature daffodils fluttering and dancing in the breeze. So there we are. Stately homes grow on you (me) with age. But it’s a slippery slope. What next, I wonder? Buying fridge magnets from the gift shop? 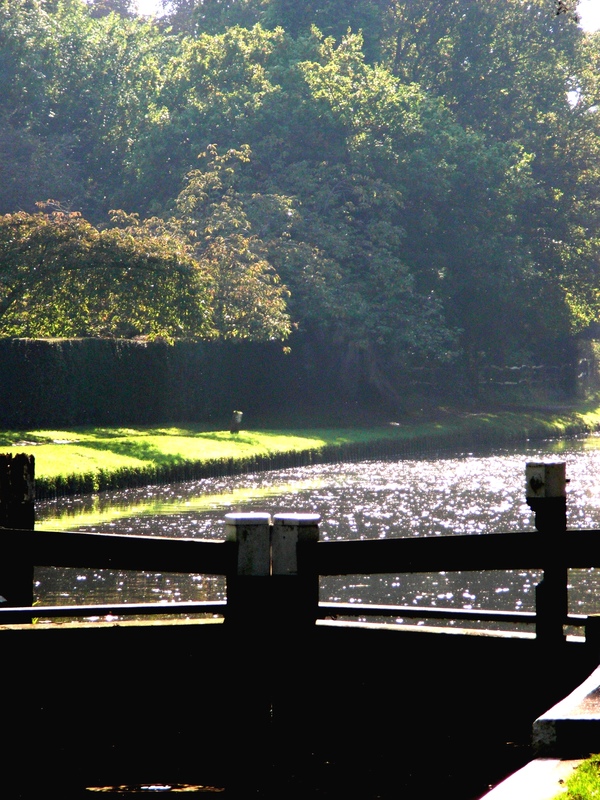 One of my preferred places to walk is down by our local river – the Wey. 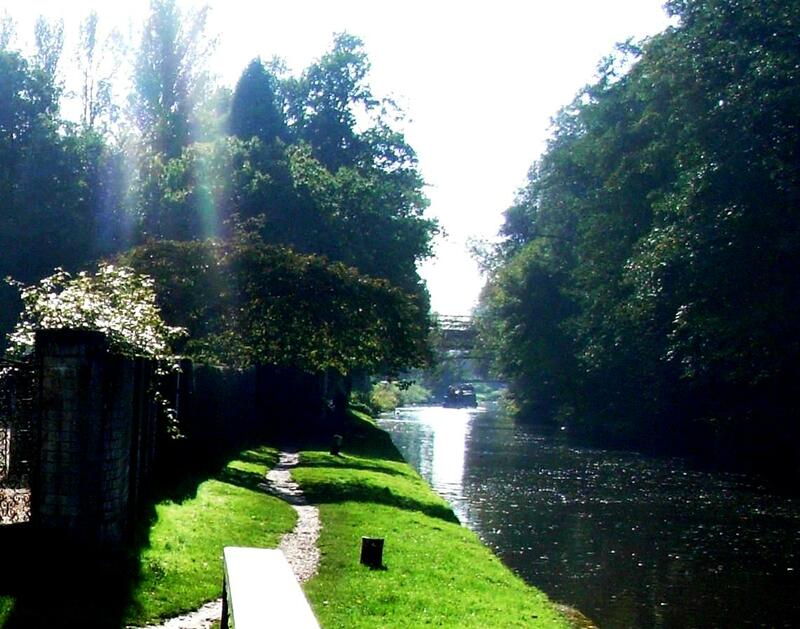 The section nearest to us is navigable and provides a scenic route along its tow path. Access is easy, as there are plenty of places to leave a car – the only downside to this is you have to retrace your steps. (Much better, if possible, to be dropped off, hike along for a couple of miles and then meet up at a pub nearby). 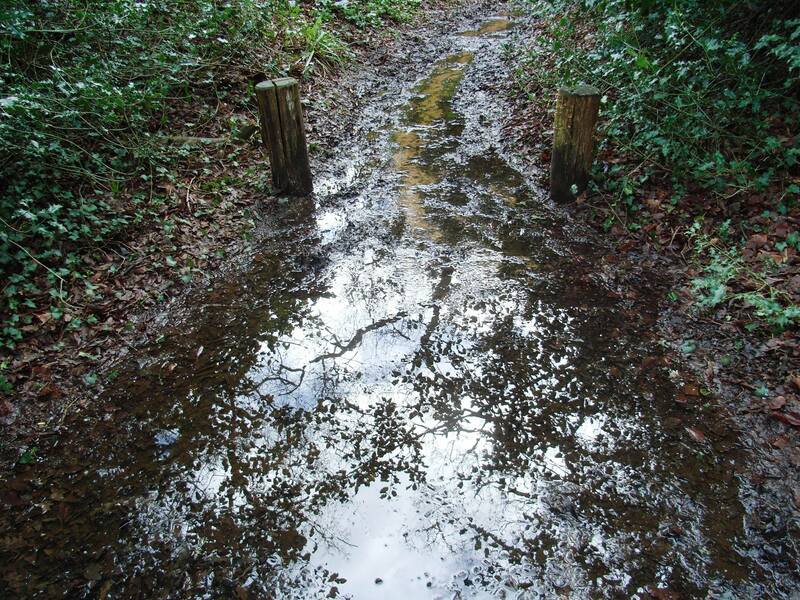 However, with my new brisk walking regime in place, and mindful of the rainfall and potential flooding in our area, I set off during one of the intermittent bright days we are experiencing at present to check out one of our regular stretches, around three miles from home. The river had disappeared and in its place, a lake. The road to the bridges was closed and diversions in place. 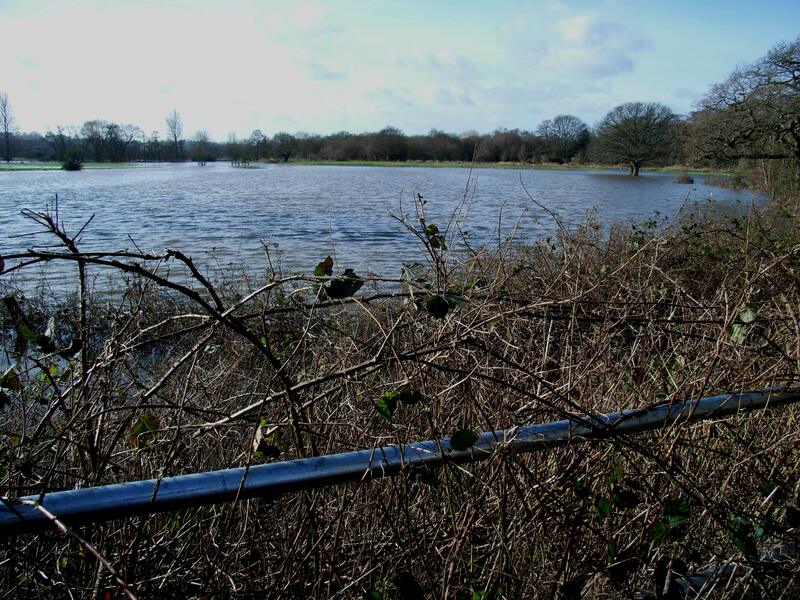 I abandoned my car in a high spot down one of the adjacent lanes and walked waded as far as I could before the water became too high for my wellies. Nothing for it but to turn back and be thankful that our house is situated far enough away from the river for it not to be a problem. 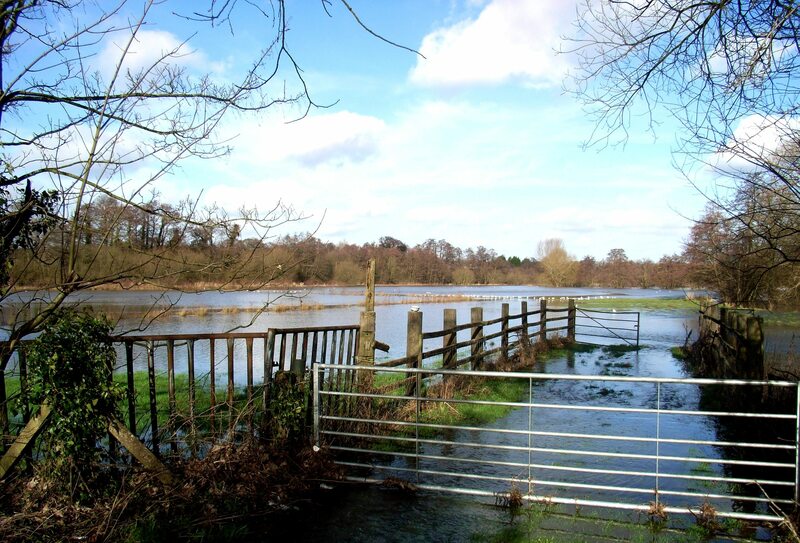 Over two thousand homes in Britain are flooded at the moment and that figure is set to rise over the next few days as the Thames reaches dangerous levels through Berkshire and Surrey. 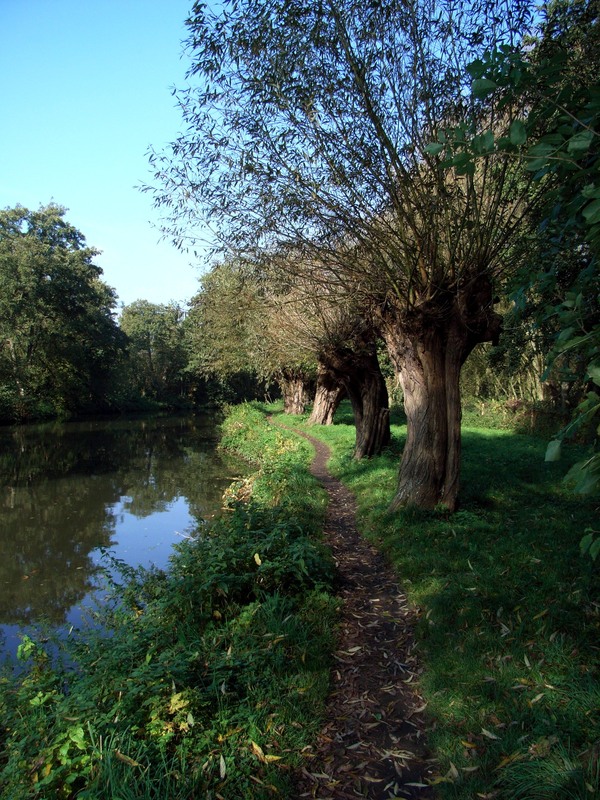 To illustrate why the Wey is one of my favourite rambles, here are some snaps of past river walks, taken at various times during spring and summer – and you’ll see why this stretch is reckoned to be one of the most picturesque navigable rivers in England. So, having picked the worst possible time to start my brisk walking regime given that we’ve just had the wettest January since records began, I must be content with the heath land that is just five minutes’ walk from my front door. I’ve been out almost every afternoon after work, only missing once or twice due to severe down pours and gales of up to seventy mph. 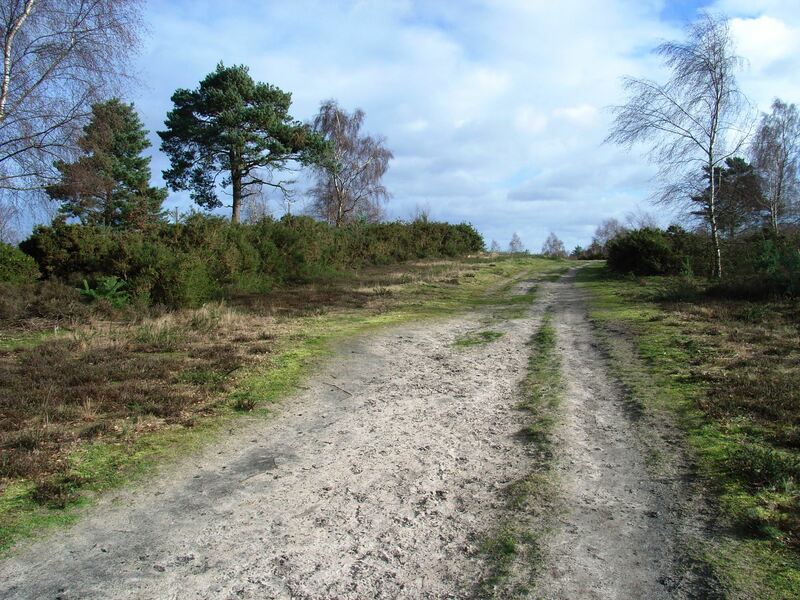 The nearest part of the heath is on top of a hill and consists mainly of sand, so once through the woodland where the water run-off is accumulating, it’s fairly dry. 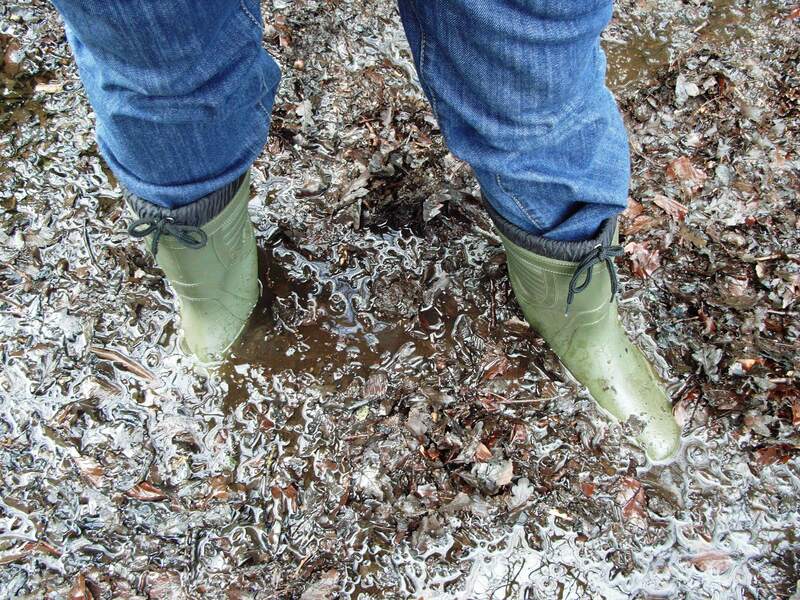 Brisk walking in wellies is not easy or comfortable but I reckon they are causing me to have twice the exercise as I huff and puff up the hill in them. I’m looking forward to doing the same walk in a pair of comfortable shoes. It’s peaceful up here in the afternoon after a day of noisy classrooms. The only folk I see are those carrying an empty lead and a few plastic bags; occasionally their dogs bound up to say hello. Once at the top, there is a view point of sorts, where on a clear day you can see the Surrey Hills and Hog’s Back in the distance. 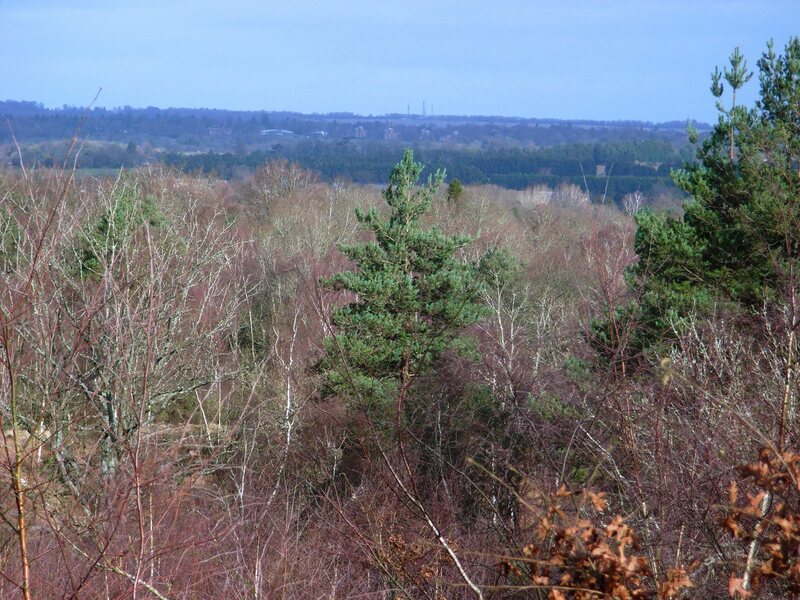 The heathland is a bit sparse of vegetation at this time of the year, amplified by the National Trust’s on going woodland management programme which involves huge swathes of our common land having old trees chopped down to make way for new shoots. 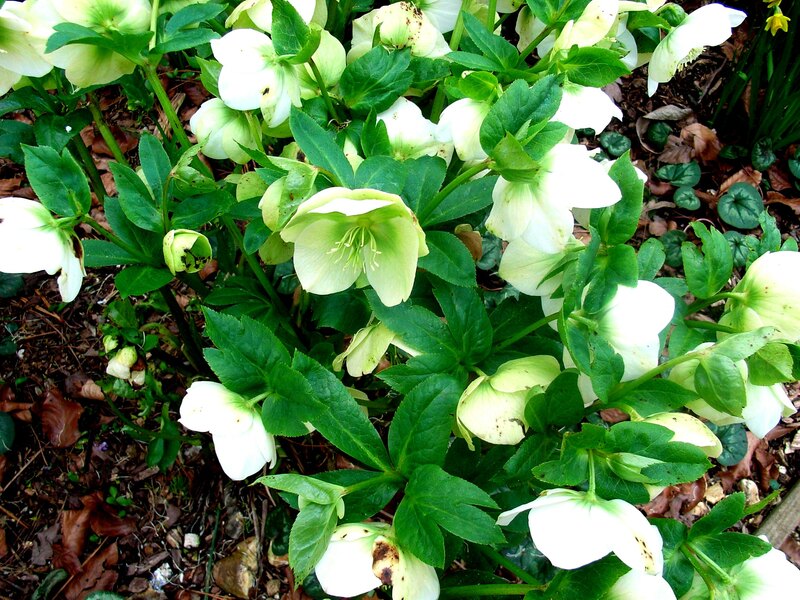 Growing in abundance on the common – do you know what it is? 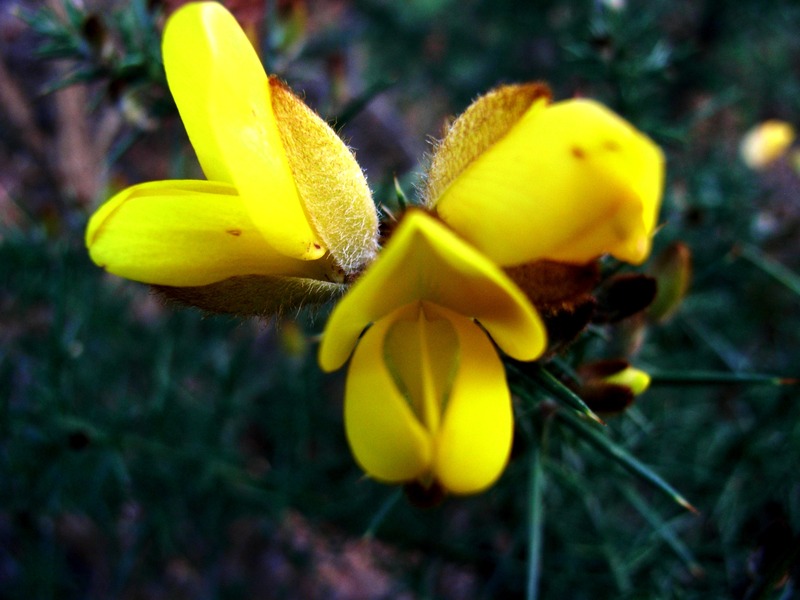 Prickly gorse seems to survive untouched – I’d never bothered to consider it closely before, but its little yellow blooms are actually quite intricate and cheerfully punctuate my daily circuit. So that’s a glimpse of my immediate countryside. 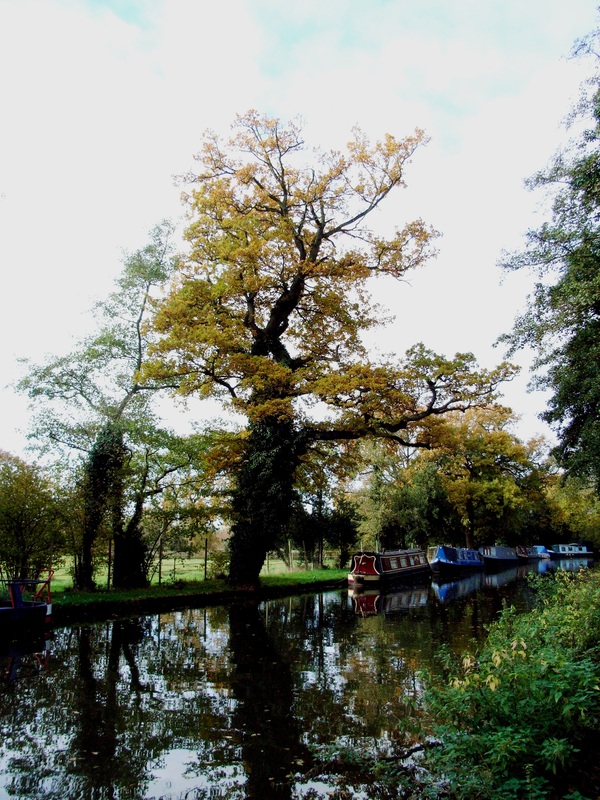 You can read more about the Wey Valley and its history here.